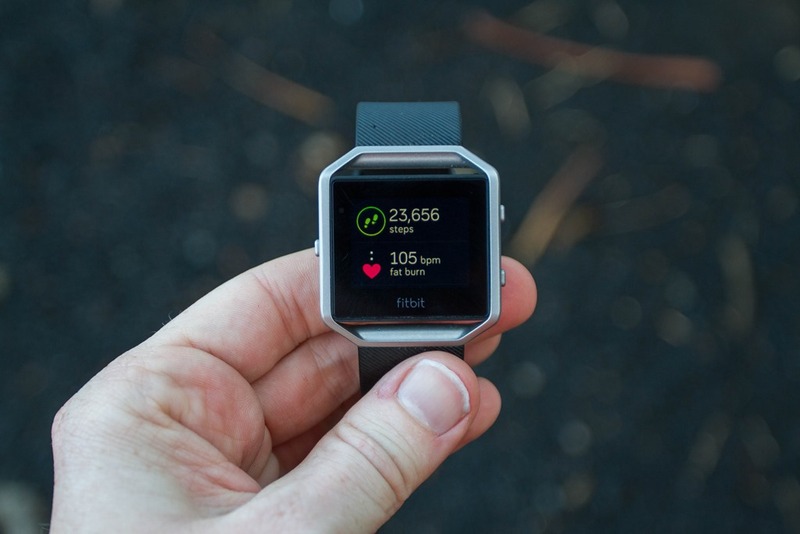 Almost exactly two months ago at the Consumer Electronics Show (CES) in Las Vegas, Fitbit announced their latest higher-end wearable, the Fitbit Blaze. 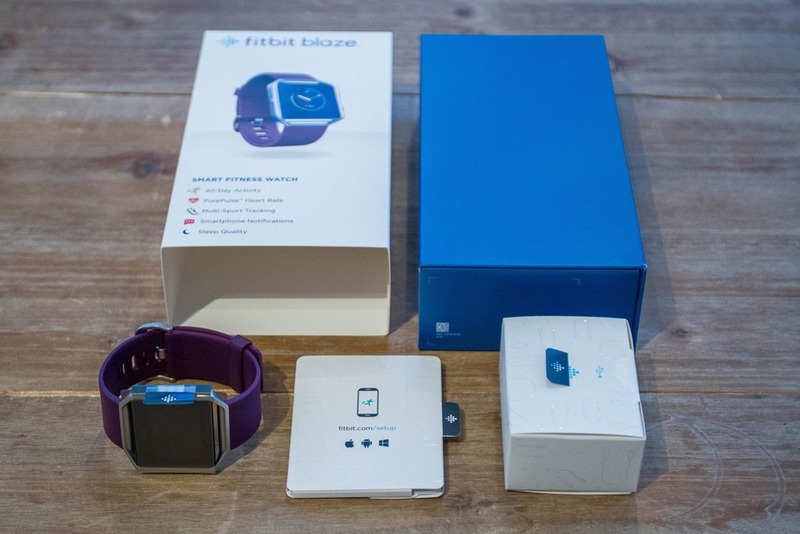 The company positioned it as a smart fitness watch, aiming to offer something midway between the higher-end GPS-enabled Fitbit Surge, and the more simplistic Fitbit Charge HR (and now the Alta). This week they started shipping units out to consumers, though I’ve been using one for a few weeks now – getting the hang of things and figuring out what works well (and what doesn’t). Fitbit provided a test unit (and a flotilla of straps), that I’ll send back here shortly, like usual. If you want to support the blog – you can check out the links at the end of the page. 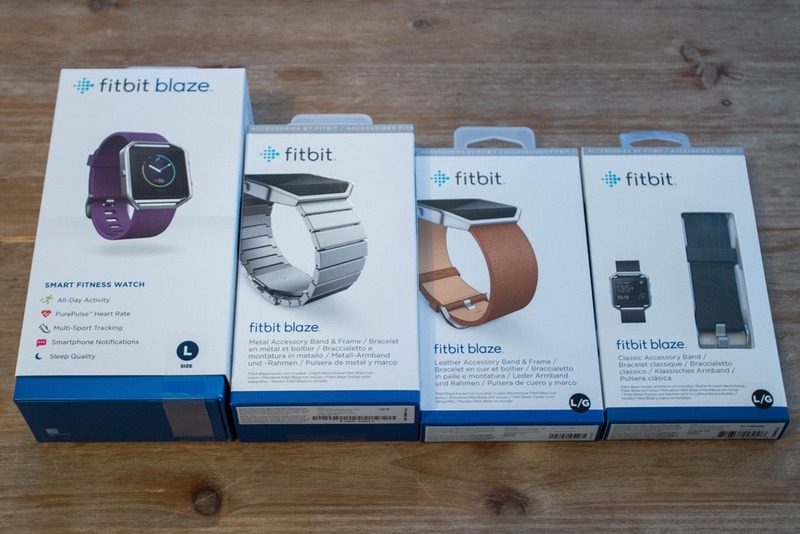 There are numerous things one could unbox when it comes to the Fitbit Blaze, depending on what (if any) accessory bands you purchase. However, for the purposes of this post, I’m just gonna keep things clean and simple and focus on just the standard Fitbit Blaze itself. Once you take off its outer clothing, you’ll find the watch inside, nestled in a protective layer, with a small box of goodies below it. Oh, and a paper manual. Inside the paper envelope, we’ve got…paper. 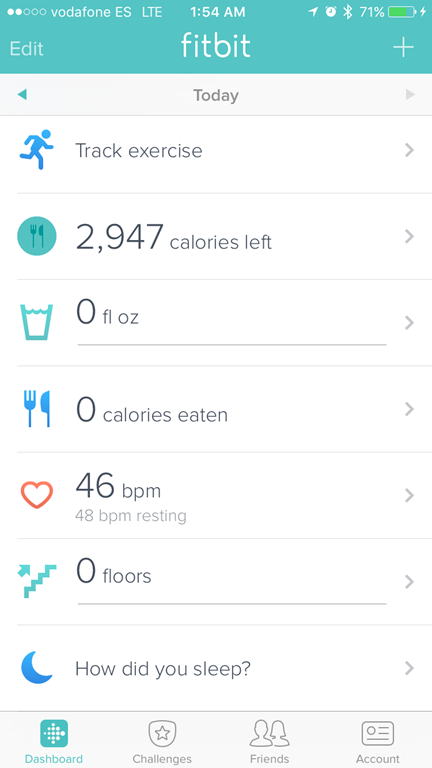 The first half of which basically tells you how to not kill your Fitbit. While the other half of it reminds you to take your Fitbit Blaze off and wash your wrist once in a while so you don’t get a rash. Or that your hand won’t fall off. Next, inside the little box is the charging container. This is like a protective cocoon to charge your Fitbit Blaze pod in. It’s honestly a bit wonky and totally unlike anything I’ve seen before (and not in a good way). You can also change the straps on pod holders too – using different straps that you purchase. 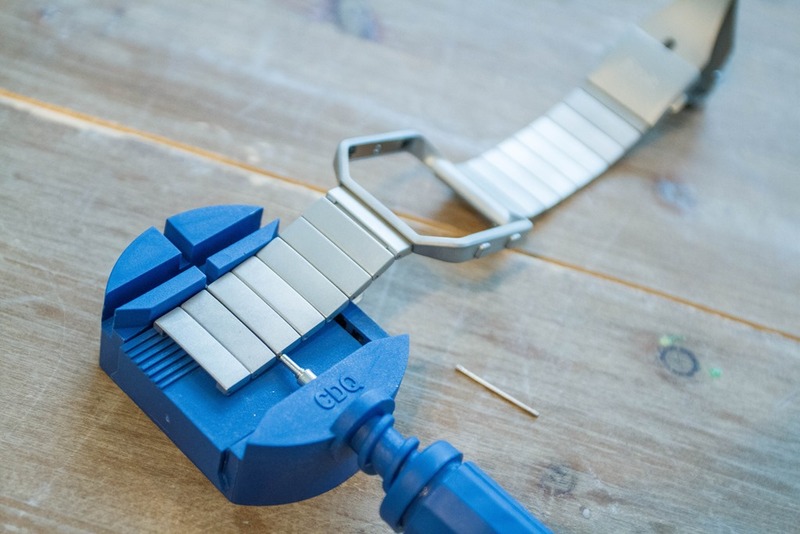 The strap has a nice little quick-release lever on it, so it’s pretty easy to do. Speaking of which, if you get (i.e., buy) the metal band ones – you’ll need to either bring it to a jeweler to add/remove links, or save yourself from ever having to go back again and buy one of these $3 tools. Ok, with that – we’ve unboxed the unit and a few of the accessory straps, let’s get on with some size comparisons. 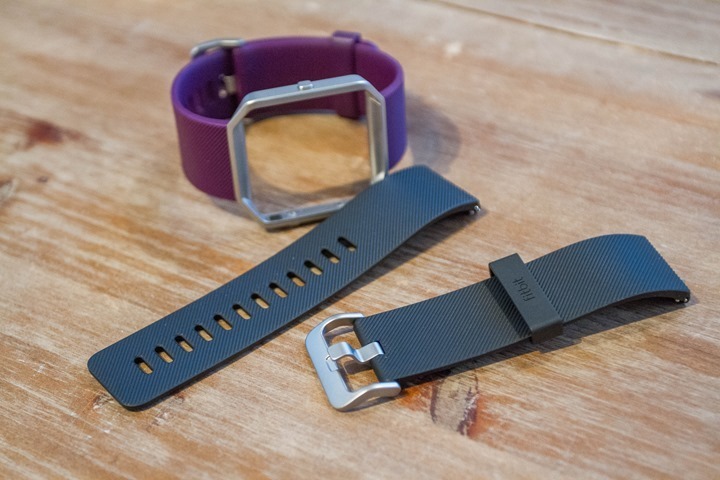 The weight of the Fitbit Blaze is totally dependent on which strap you buy. Using the default straps, it comes in at 44g (slightly less for the small size). For reference, this is within a few grams of Garmin’s GPS-enabled Forerunner 230, 235 and 630 series. It is thinner than the Fitbit Surge, as seen below. The Surge is a bit thicker than many other GPS watches today though. 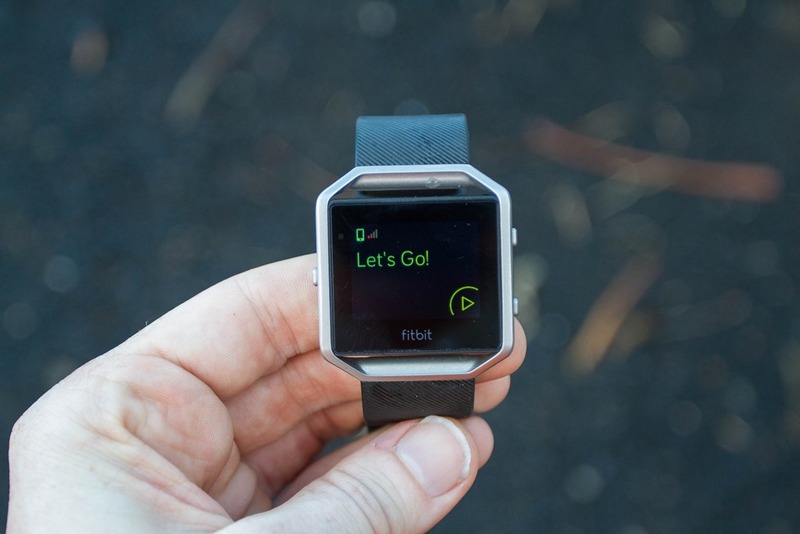 The Fitbit Blaze is also a tiny bit thinner though than some of the other GPS-enabled watches on the market, however, for others that is also a slight optical illusion. 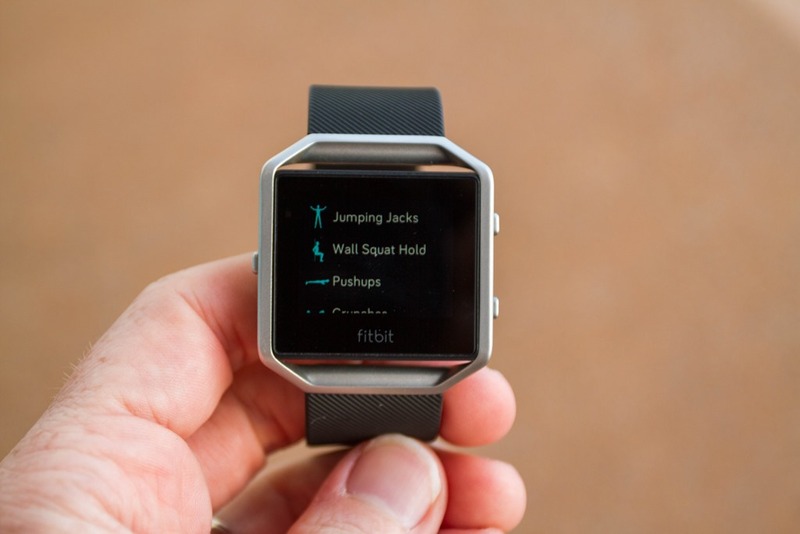 See, the Fitbit Blaze tapers the bottom of the watch a bit more than most. So it appears to disappear under the band’s bezel. A very nice little cosmetic touch. 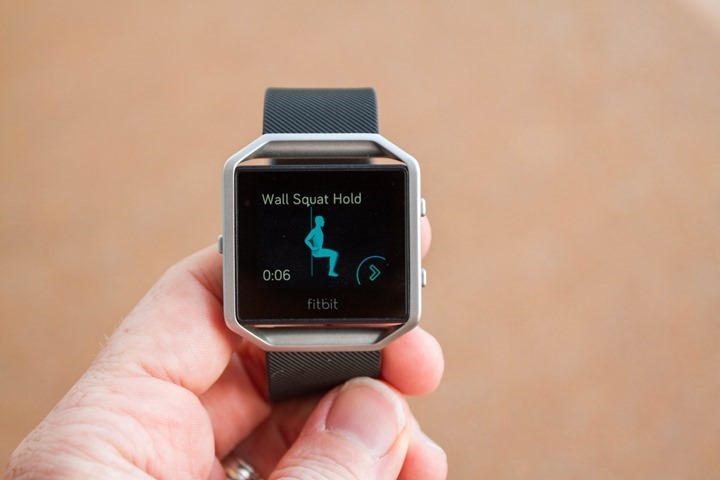 Without question, Fitbit is known for their daily activity tracking. 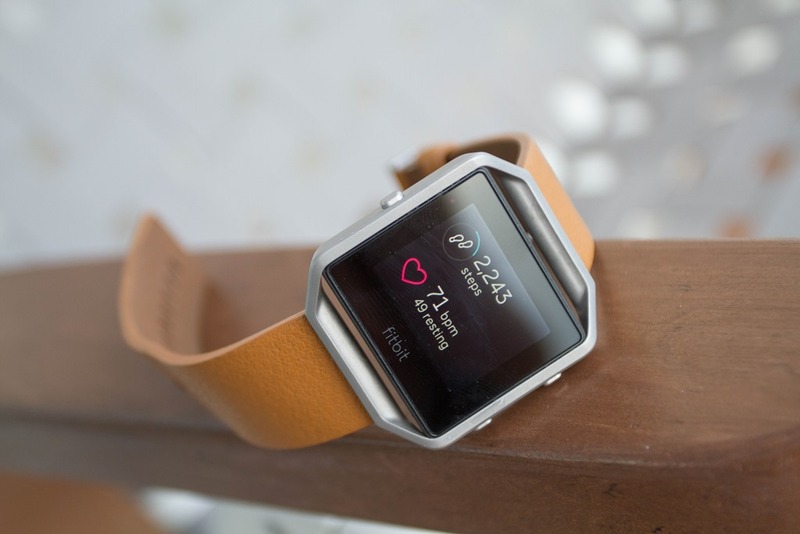 They are, after all, the biggest seller of activity trackers (yes, even more than Apple). And for good reason – their platform is simple and easy to use, and their social features make it easy to compete against friends and family (or Bob from Accounting). 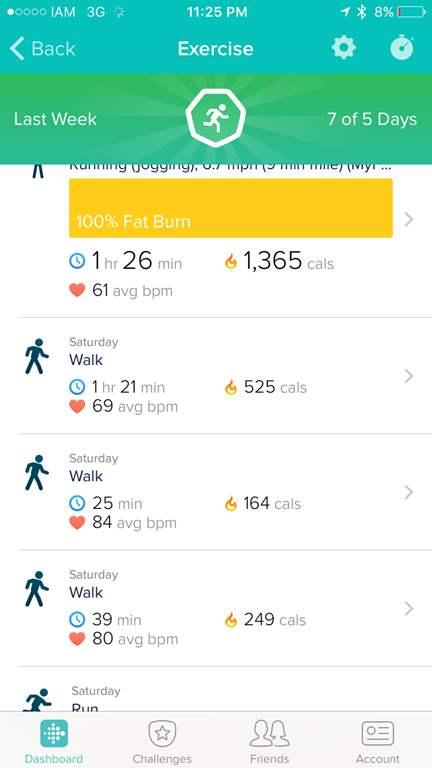 All of this is also mirrored on the Fitbit App, which syncs via Bluetooth Smart in the background. Further, depending on which watch-face you use, you can also show some of these stats in varied forms as the default stats (i.e. 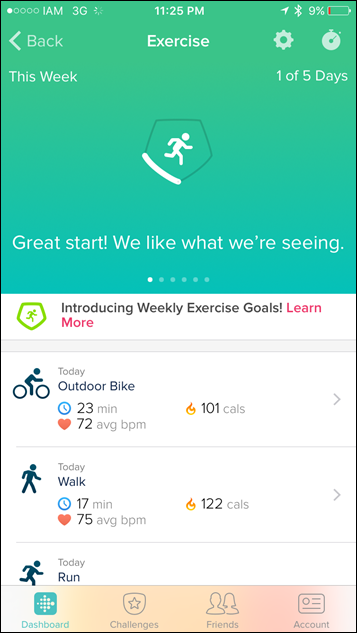 setting HR to show, or a ring indicating how much progress towards your step goal you have). For steps, the unit tracks them pretty much just as any other Fitbit has in the past. And based on what I’ve seen wearing 2-3 different activity trackers per day over the last few weeks, it’s equivalent to others in terms of accuracy. 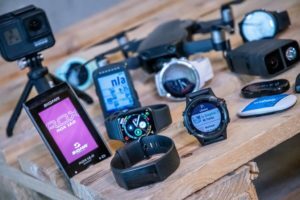 The Garmin Fenix3 HR and Fitbit Blaze would often only show a difference of a few hundred steps (on 15,000-20,000 steps per day), which is well within what would be considered normal. As always with steps and devices on the market today – it’s best not to focus too much on whether it’s precisely step-accurate, but whether it’s in the right ballpark. Meaning, if you’ve actually walked 8,587 steps and the device counts 8,300 steps – then don’t fret. Of course, if it tracks 16,000 steps when you only walked 4,000 steps – that’s a clear issue. The thing is – you’re really aiming for trends. 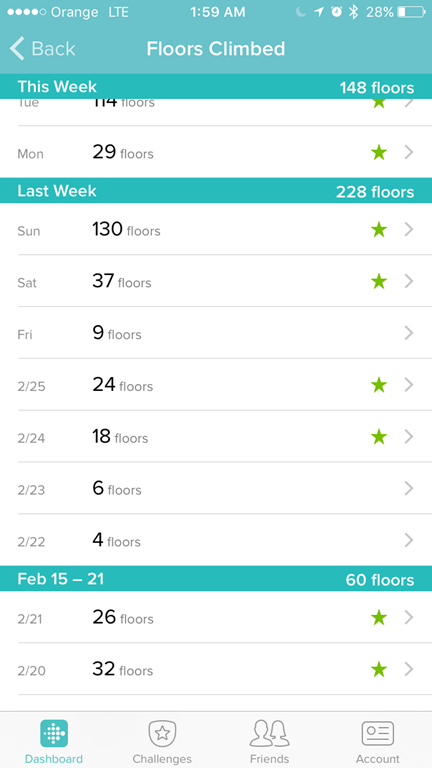 If your step goal was 10,000 steps and it shows 2,000 steps for the day, then more than likely you were lazy (or having a solid recovery day). Being off 50 or 100 steps is the least of your issues. Additionally, all companies in this space attempt to deal with ‘edge cases’ differently. Such as showering, washing your dishes, or even rough roads while driving. For 99% of people in 99% of cases, this works out just fine. But since every human is different, there are no doubt certain people that for whatever reason the itty-bitty differences in how you move your wrist during certain activities isn’t understood, and thus it fails. Sometimes you’re the pigeon, and sometimes you’re the statue. Next, beyond steps it also measures floors climbed (stairs). It uses a barometric altimeter in the device to measure this. 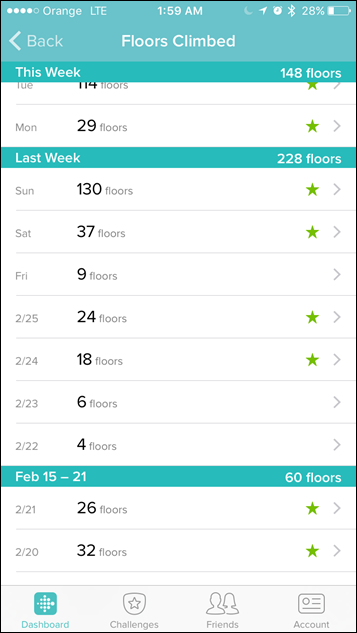 In theory, it combines this with step data to ensure that the simple act of going up in an elevator in Manhattan doesn’t trigger the device to give you 50 floors. But I’ve found in reality, it’s not quite perfect. For example, on Sunday it said I climbed 111 flights of stairs by the time I took this photo (130 by the end of the day). I assure you, I did not. Some of these flights may be the result of a run with some hills (850ft to be precise), but it’s unlikely I ran something the height of the Empire State building (1,454ft). But I saw this a few times with significant overages on stairs. Next we’ve got sleep. 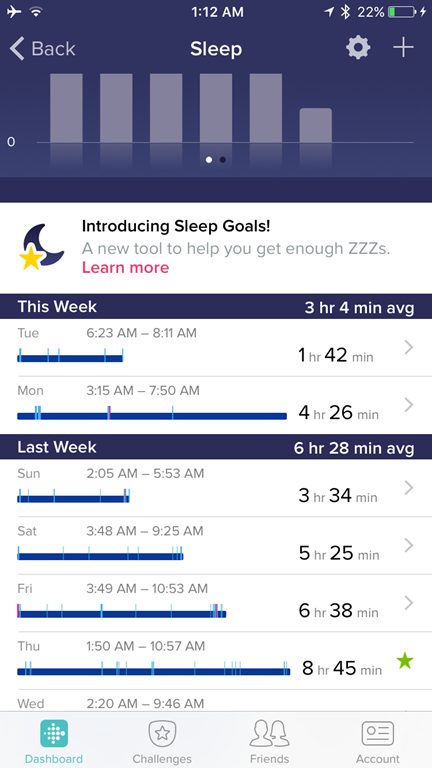 The Fitbit Blaze will automatically track sleep and states of sleep. In my experience over the last two weeks it really nailed this. It only failed once (yesterday oddly), where it didn’t notice I was asleep until 6AM My only suspicion there is that I was sleeping on a boat all night in semi-rough seas, so perhaps that was (understandably) throwing the sensor off a bit. 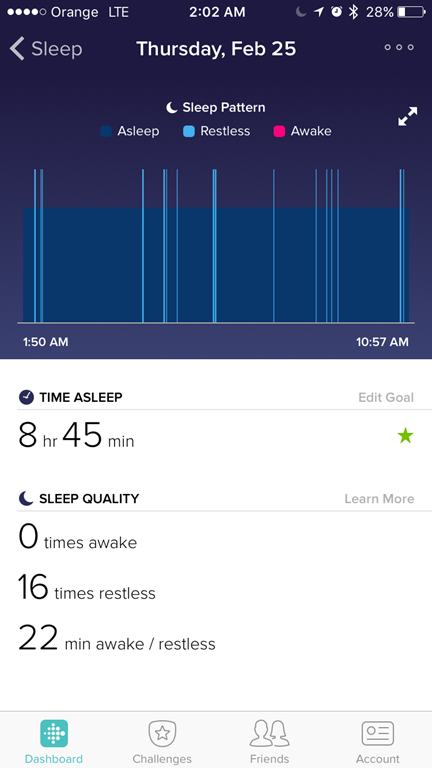 The app will also show you the various sleep states, per what Fitbit believes, however, this isn’t something I’m able to validate at this time. But – it’s there if ya want it! Note that while the Blaze has silent time alarms you can setup via the App, it does not have any form of smart alarms that wake you based on sleep cycles/states. Finally – we’ve got the ability to auto-recognize activities. 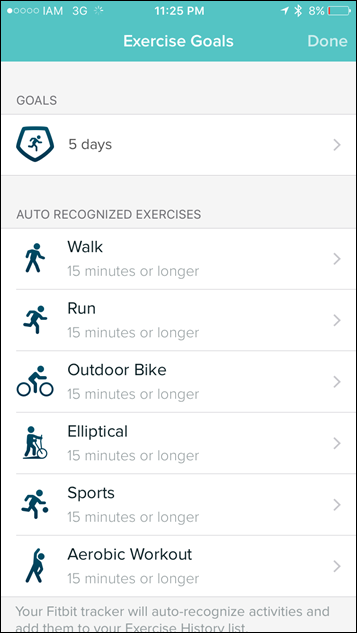 This is new to the Fitbit Blaze, and will automatically generate workouts within your app screen based on longer walks, runs, or rides. 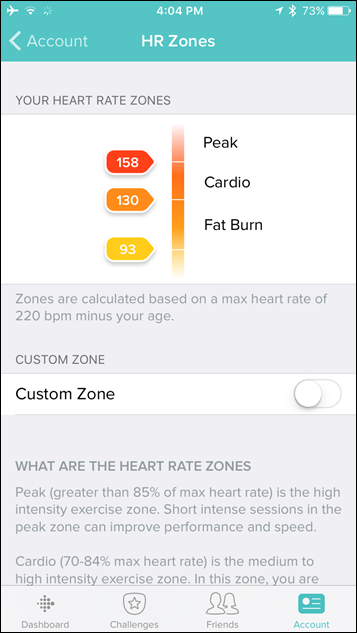 It analyzes the data behind the scenes and then shows you these ‘workouts’ on your app dashboard. 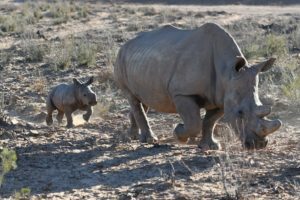 The idea behind this is that you may be out walking around (for example as a tourist) for the day, and this will create activities for you automatically. You can see this over the last few days for me as I’ve been in and out of various cities. You can adjust the settings on this within the app. This controls whether or not it’s enabled, and if so – what the minimum threshold is for that particular activity. I like what they’ve done here though with the customization and enablement/disablement options – super clean, and much more refined than what other companies are allowing right now. 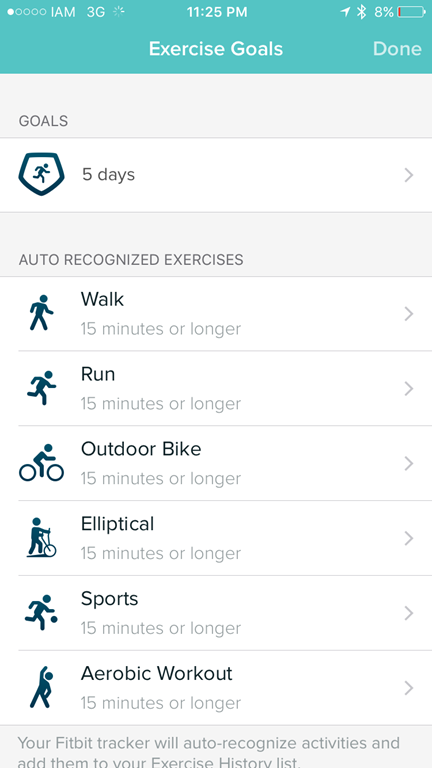 Remember that auto-recognize is good for catching activities during your day to day life that you likely otherwise wouldn’t track as a standalone workout (such as a walk to work). However, it doesn’t enable GPS on your phone, and won’t be as accurate as starting an actual workout since the exact starting/ending point might vary based on how well Fitbit predicts what/when you started. 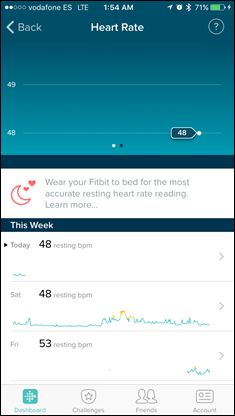 The Fitbit Blaze follows in the footsteps of both the Fitbit Surge and Fitbit Charge HR, in terms of doing 24×7 monitoring of your heart rate. It does this at constant-on every second, which is recorded at 5-second intervals (1-second for workouts). Aside from the Basis Peak (every second all times), this is one of the highest recording rates in the industry. 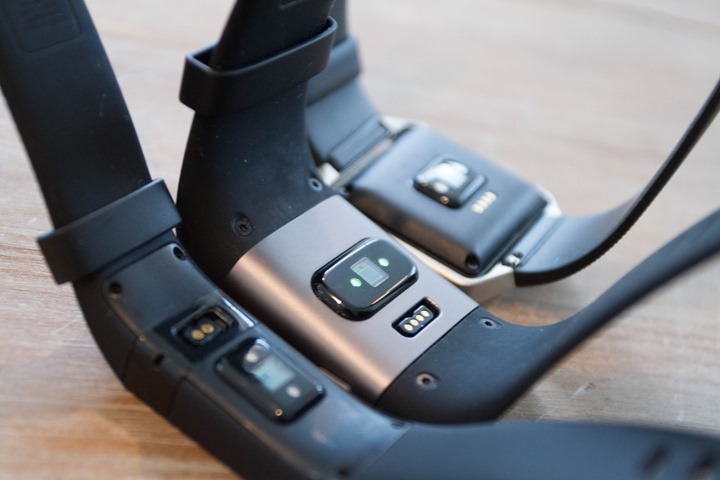 It uses the optical HR sensor on the rear of the unit, which uses a green LED light to illuminate the capillaries below your skin, while the optical sensor reads that to determine your heart rate. 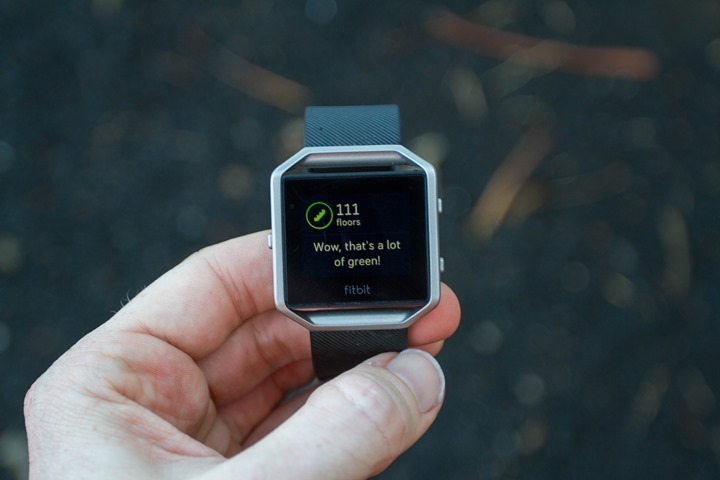 In the case of Fitbit, they’re using what they brand as their ‘PurePulse’ technology – which is more or less the same technology used on the Fitbit Surge and Charge HR. However, they have noted they did some additional work on it since then, specifically around the high intensity areas for workouts, per their announcement talk in Las Vegas as CES. 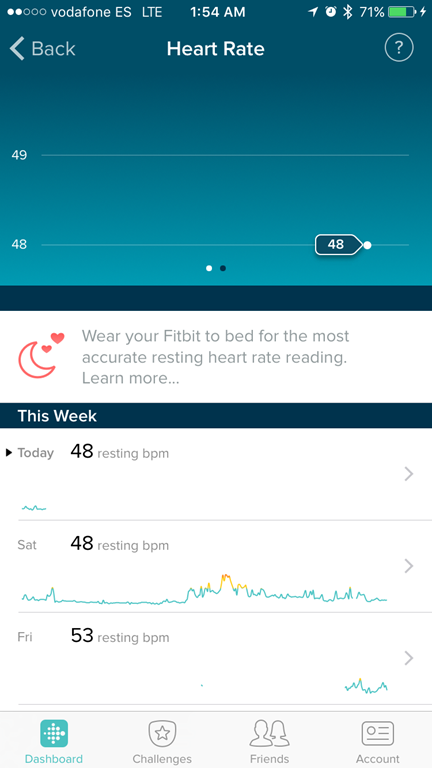 For each day, Fitbit also specifies a resting HR value (RHR). This value is virtually always wrong, as it overestimates your resting HR. By definition your resting HR value should basically be your lowest HR value of the day. 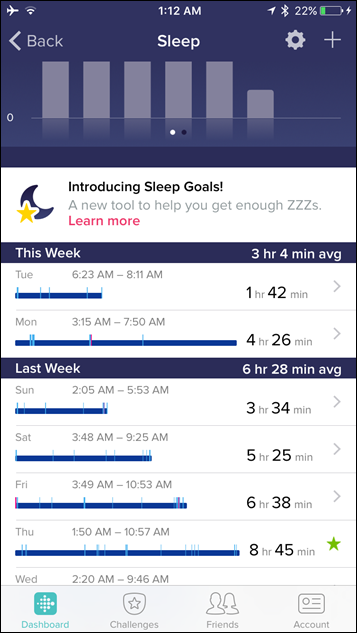 There is some ambiguity/disagreement on whether or not you include HR values at sleep, but that doesn’t really matter here – because Fitbit gets it wrong either way. 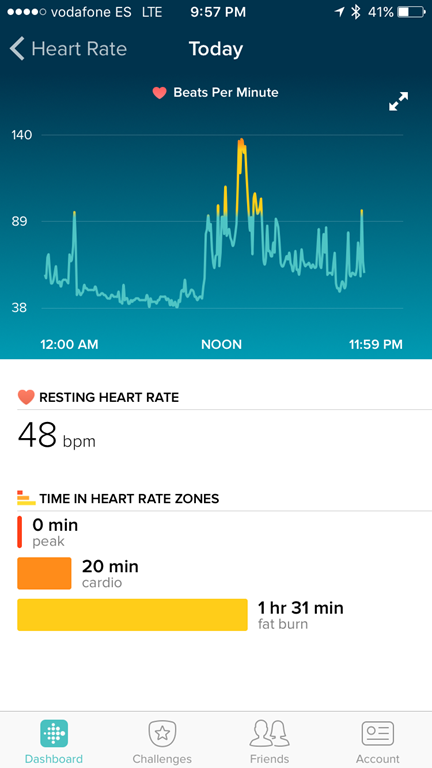 I could have a HR sitting here writing this post of 42bpm, and Fitbit will say my resting HR is 50bpm for the day (and even show the lower values). Below being a perfect example of the app showing me sitting around (live) at 46bpm, yet my resting HR being 48bpm. 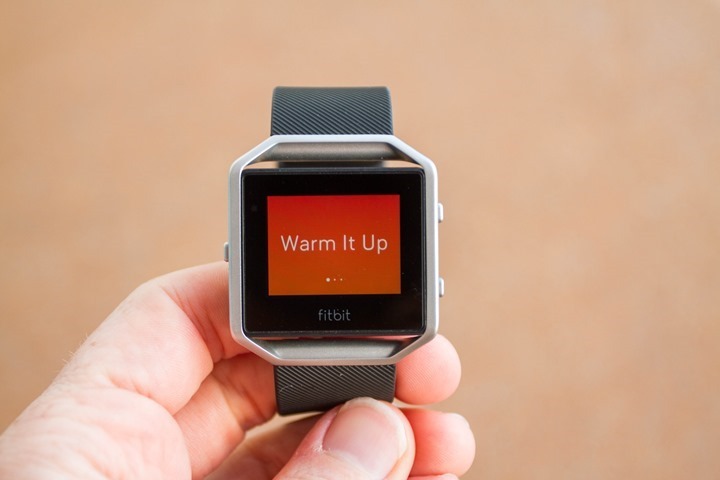 Now, for Fitbit’s part, during discussions with them last week about this and it sounds like you’ll start seeing some improvements over the next few weeks. Nonetheless, the 24×7 tracking of HR is pretty stable otherwise – and seems pretty good (except for the workout issues as noted below). 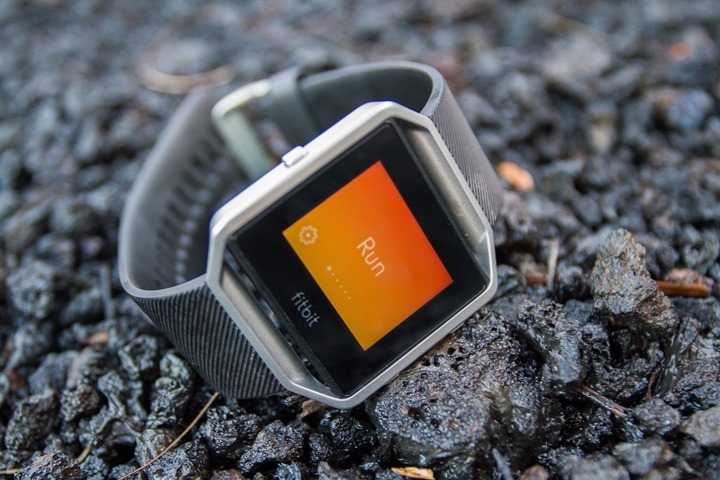 When it comes to running, the Fitbit Blaze has two basic modes: With GPS and without GPS. And by ‘with GPS’, I mean, with your phone. That’s because the Blaze doesn’t have GPS in it, but rather depends on your phone. They’ve cleverly named this “Connected GPS”. But make no mistake – you need your phone if you want a GPS track or specific distances. So, I’ll start there, and then circle back to the non-GPS variant later in this section. At this point, if your phone is nearby (within range of Bluetooth Smart), and the Fitbit app is running in the background, then you’re good to go. Next, is the ability to change the ‘secondary stat’ on the display. Or basically, the stat along the bottom during your run. With that decided, you’ll go ahead and press ‘Go’ (the play button). At this point the unit will start tracking and you should start running. Note however that Fitbit doesn’t offer a satellite view (only standard map views). So you’d have to sync to a 3rd party service to see that (such as Strava). For pace, things seem pretty consistent using the phone’s GPS, and seem to be in-range of what I was getting on two other GPS units at the same time. However, I do see slightly more variance in GPS accuracy using the iPhone 6 GPS than I do on a dedicated GPS device, primarily in building areas. However, for the vast majority of scenarios I’ve run/rode with the Blaze/Phone combo – it worked out just fine. 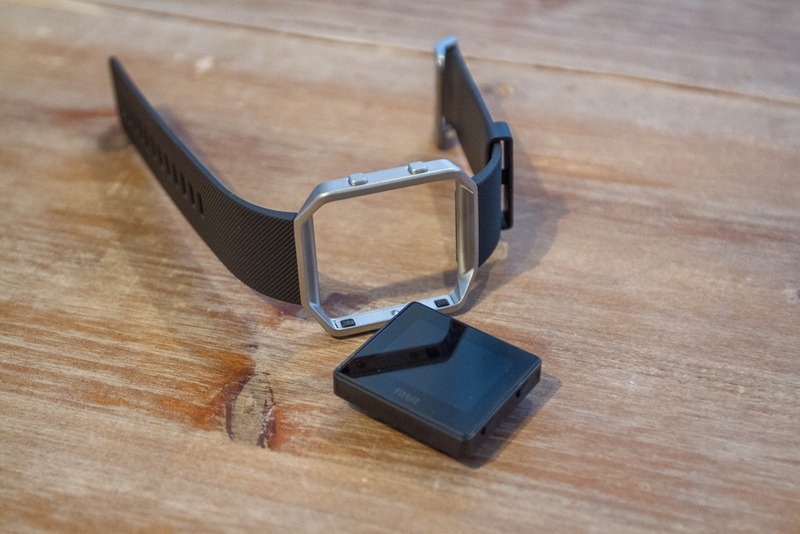 Next, the unit includes the optical HR sensor for sport (as well as the 24×7 mode I discussed earlier). During sport mode, the Blaze kicks up the sampling frequency to every second, allowing for more granular data. 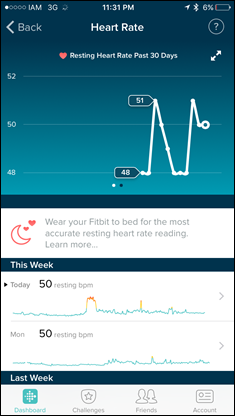 When it comes to heart rate accuracy using the optical HR sensor, the short version is that things don’t seem much improved from the Fitbit Surge or Charge HR. Both of which suffered from less than ideal HR accuracy. To demonstrate this – I give you a handful of different runs. 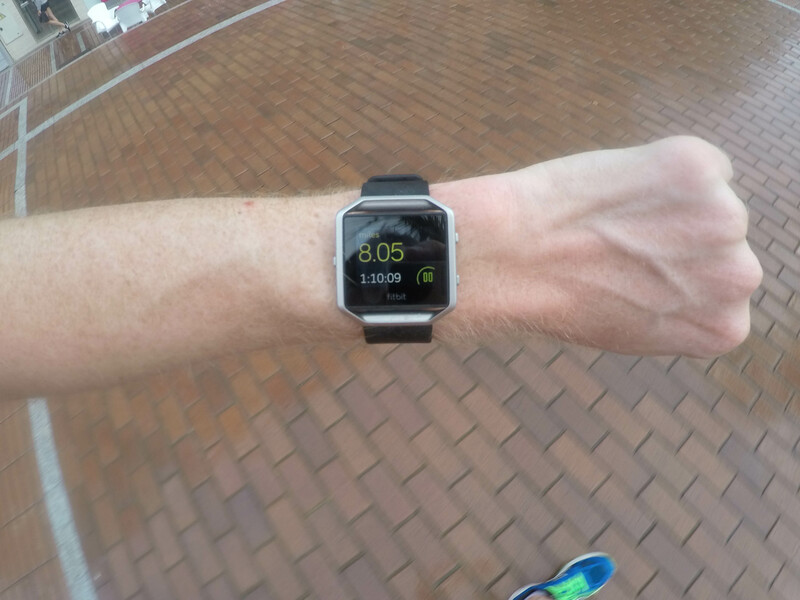 The weather during these runs was actually rather favorable to optical HR sensors (60°F/15°C+). Cold weather can be challenging for sensors, but in this case it had it easy due to my current travel schedule. First up, a run in Barcelona for about 12ish miles (19 KM) at various paces/cadences. In this case, you can see that while it tracked well for large portions – the vast majority of the run actually. It struggled initially for some reason though. Next, a run with The Girl at night, albeit kinda warm. This was a slower pace for me, so my HR was much slower (130BPM). 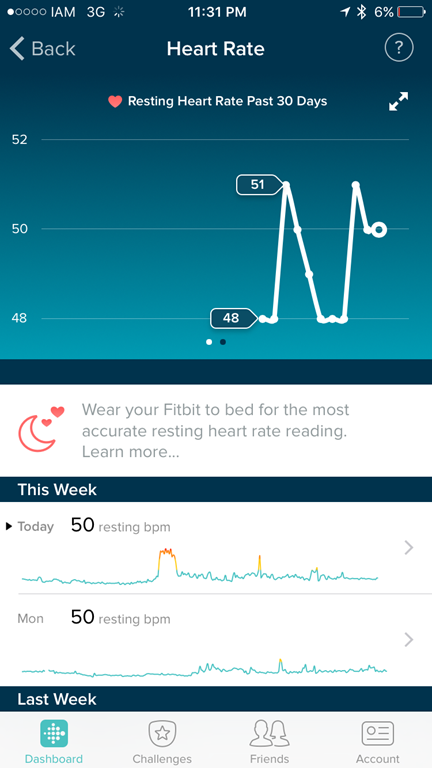 However, the Fitbit Blaze was showing nearly 20-30bpm higher, around 160BPM. Why? Well, it made the classic mistake of optical HR straps: It locked onto my running cadence. This often occurs when a heart rate strap can’t find your heart rate – as it finds the next most powerful thumping thing (your feet). #1: The Fitbit doesn’t match the profile, it just kinda wanders. 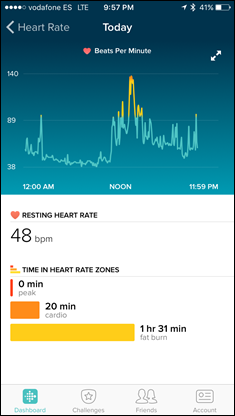 #2: Note how even I actually am, whereas the Fitbit is spiking some 20bpm different. #3: I decrease in HR slightly here, whereas the Fitbit actually increased. 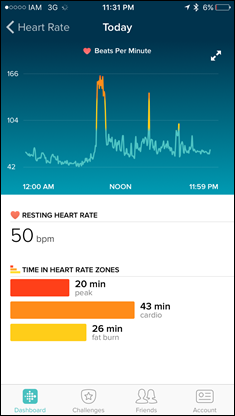 Note that I decreased HR because I went downhill, where the Fitbit Blaze mistook increasing cadence as HR. Here’s another run, this across a wide number of different terrains from road to trail to lava rock. Also, rather varied intensities, and increases/decreases in elevations. While the Fenix3 HR was hardly perfect, it was far closer to the HR strap than the Fitbit Blaze (along the bottom), which was pretty much consistently off. 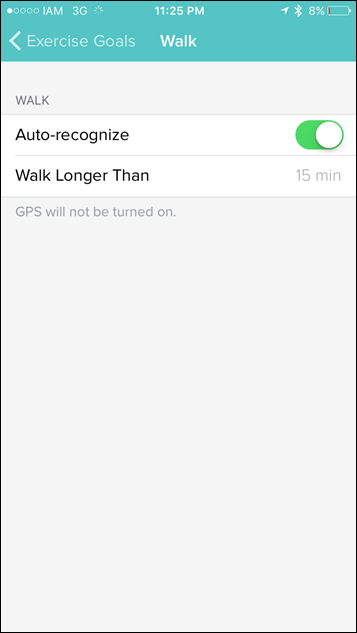 Finally – what about the mode where you don’t use your phone for GPS? Well, things actually worked out fairly well there at my ‘normal’ paces. Meaning, if I take a look at today’s run, the first portion of the run was typical long-run paces. And, for those first 2-3 miles (without a phone), the distance was within .01-.02mi per mile (so 1-2%). Not too shabby. However, as I increased my pace towards intervals the pace tracking started to slide a bit, which in turn resulted in the distances starting to become further and further apart. Ultimately, it ended at 7.35mi vs the GPS-watch tracks of 7.78mi (FR630) and 7.79mi (Fenix3HR). This doesn’t surprise me terribly since I often see variations using wrist-based accelerometers. However, this is a bit on the outside edge of what I’d consider normal. Note that it is important that for watches to ‘learn’ your running style that you use the watch on the same wrist each time. 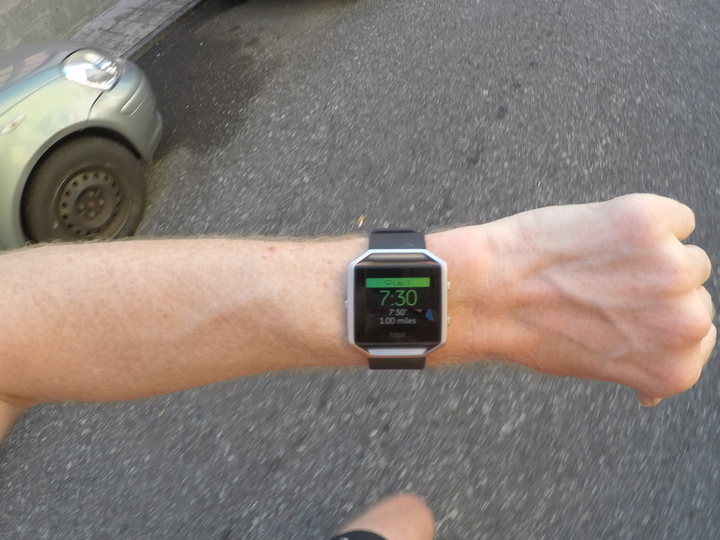 If we look back at past Fitbit efforts with cycling, such as the Fitbit Surge GPS watch, you’ll find that the experience wasn’t so hot. And unfortunately, the same is true with the Fitbit Blaze. Accuracy isn’t its strongest point here for heart rate. Though, GPS is fine (coming from the phone). The setup is essentially the same as running, you’ll dive into the exercise menu and then select cycling. There’s no option to pair to ancillary sensors (like a speed or cadence sensor). You only get the option to change/select the secondary display stat (i.e. speed, heart rate, etc…). Once cycling, you’ll need to turn your wrist to get the screen to illuminate, so like the Apple Watch it’s a bit of a pain because even if you were climbing and had your hands closer to the stem and the watch face visible, it’d be off. But none of that really matters – because the data isn’t all that accurate. The vibrations in the road appearing to cause the most issues. For example, if you look at this ride, you’ll see large variances between the HR strap and the Fitbit Blaze. It appears that the Blaze sorta understands the peaks and valleys, but is just off by 50-60 seconds in some cases (and totally misses some shorter efforts too). Now, this is somewhat common for wrist based optical HR sensors while riding. About the only company that seems to nail this configuration is Mio, with their Mio Link/Alpha/Fuse/etc… products. 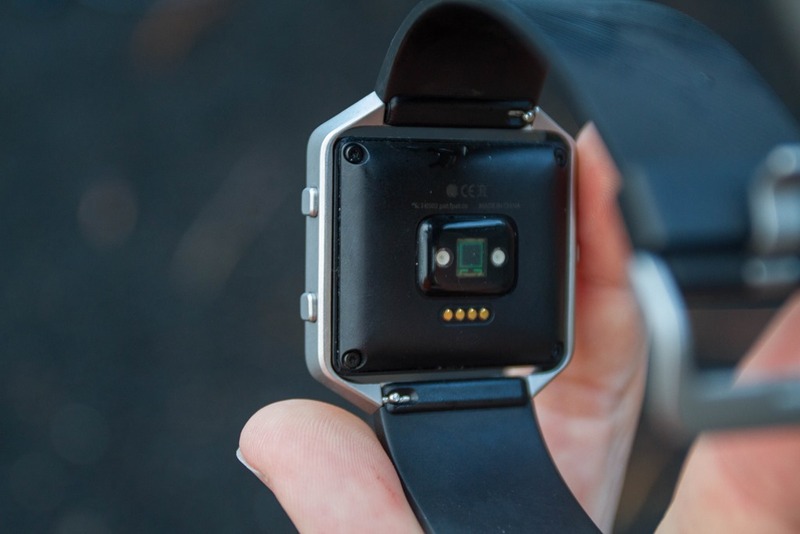 Also Scosche with their optical enabled arm-band sensor. As noted earlier, given Fitbit has largely used the same sensor as the Fitbit Surge – I wouldn’t have expected too much variance here from the past – and that is indeed what we see. For cyclists, you’re far better off sticking to either a dedicated device, or just a HR strap and a phone app. 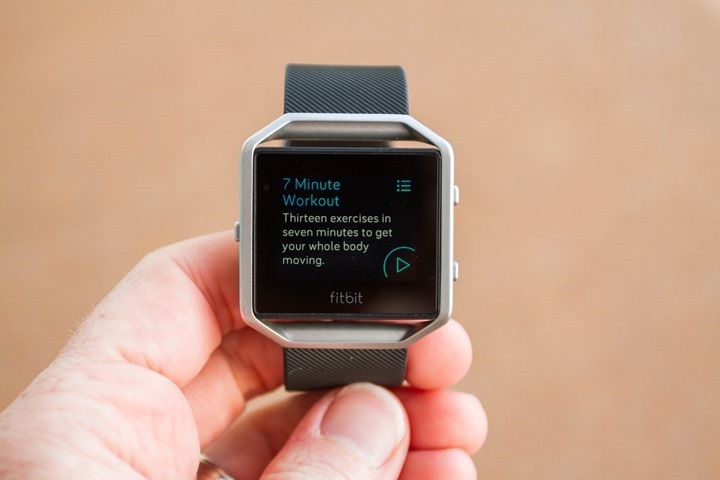 One of the most unique features to the Fitbit Blaze is its inclusion of FitStar functionality, which Fitbit acquired a year ago. The Fitstar piece allows you to do guided workouts, complete with instructional animations. This functionality acts and runs like an app on the Fitbit Blaze, so it has its own little section that you swipe to. Once in it, you’ll choose one of a handful of workouts. And by handful, I mean three: Warm it up, 7 Minute Workout, and 10 Minute Abs. As you do each component it’ll give you a small 10-second animation of how to complete that exercise (which you can tap to skip). And that’s pretty much all there is to it. It is pretty cool – and executed very well. However, it just needs expansion – a lot of it. Fitbit said back at CES they plan to expand this functionality. So for right now it seems more like a demo than something that’s complete. Especially if you compare it to efforts by Adidas (Smart Run GPS) in terms of guided workouts, or the Microsoft Band structured workout library, which is mind-bogglingly massive. Ahh yes, the smartphone notification section. Also known as: The section where I wish there was smartphone notifications. 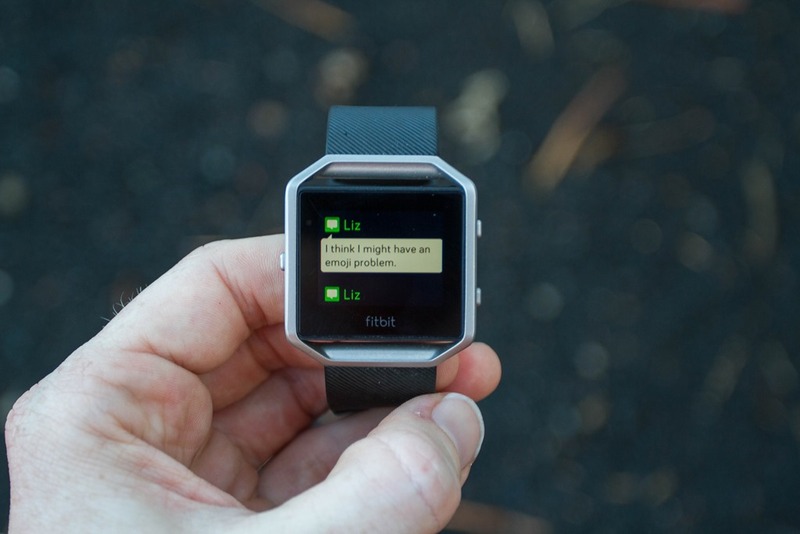 See, the Fitbit Blaze alludes to phone notifications, but it has the 1992 dumbed down version of them. Meaning, you only get calls, texts and calendar alerts. If you’re like 95% of the rest of us in 2016, you also get Twitter, Facebook, Snapchat, Instagram, and all sorts of other notifications on your phone. After all, the entire point of notifications is to (wait for it) – notify you. If you don’t want those notifications, it’s silly easy to turn them off on your phone. But alas, Fitbit doesn’t give us that option. For them, it’s just texts, calls, and calendar alerts. For those wondering, they are to my knowledge the only major wearable company that has this limitation. All others just use the standard notification center functions. Still, in case you’re wondering – here’s how it works. Starting with call notifications, these will come in and show you the number on the screen. You can press to accept the call, which in turn answers it on your phone (not on the watch). Or, you can reject the call (my personal favorite). Next, for incoming text messages you’ll get a bit of a continual timeline. This timeline shows you the most recent text messages as they come in. So it’s not threaded by person, but rather just most recent to latest. You can swipe up and down to get to older ones (or newer ones if you’ve swiped a ways down). 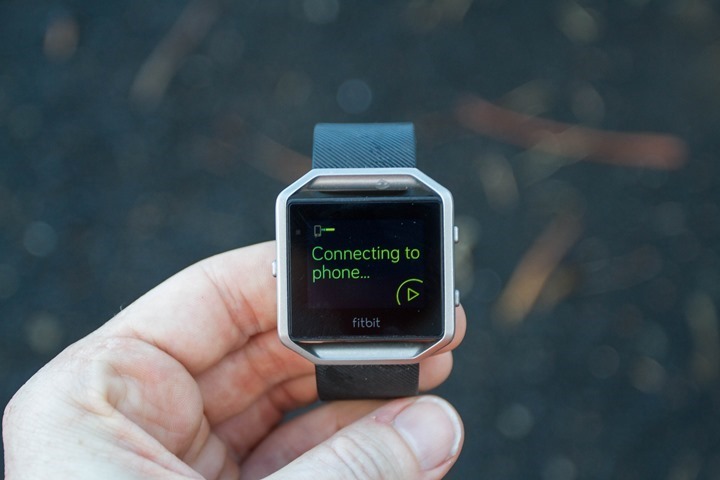 Fitbit will automatically clear off older ones for security reasons after 24 hours, since there is no ‘lock’ function on the device. Ultimately, the lack of real smartphone notifications may be the single biggest issue with me wearing the unit day to day (except sport/fitness). Music Control: The Blaze includes the basic ability to pause/start, and change tracks on your phone. It can also increase volume with up/down. It does NOT have music storage on the device itself, but rather just acts like a secondary display to control music. Again, it does require a phone be paired to it, and the music streams via your phone, not directly from the device. To access the music menu, you’ll simply swipe down from the top – or during workouts by holding the upper right button. Battery Life: The Blaze gets a stated battery life of about 5 days, and I’ve found it’s roughly in that ballpark. No issues with battery life. Though, I will say that the charging dock thingy is pretty weird. First, it uses a permanently affixed cable, and feels super-cheap. So I suspect I’d eventually break it. Now ideally if they had to use the weird charging box, they would have just used a standard micro-USB cable to connect to it (just like Basis does), so that you could have it be multi-use, and easily replaced. Waterproofing: The Fitbit Blaze is not waterproofed. Technically it is listed as “sweat, rain and splash proof”, but is not swim or shower proof. Which means that you can go out in the rain with it, and it should be fine. But you’re not supposed to get clean with it. Still, for completeness sake – I did shower with mine without any issues. Which doesn’t surprise me. After all, the sweat on a watch will ultimately kill most non-properly-waterproofed units far quicker than plain shower water. Sweat dries, and then pulls water back into the cracks when it hydrates again. It’s fascinatingly pervasive. Either way, another Fitbit high-end unit without waterproofing. As I often used to say about Garmin units a few years ago: I can buy a $15 watch at Walmart that has proper waterproofing, thus, a $200 one should as well. End of story. 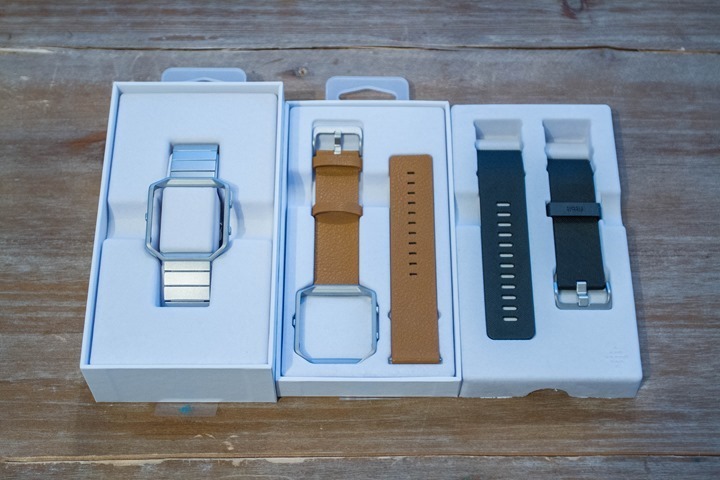 Watch bands: I’ve gotta say, I do like the watch bands. I’ve got three of them (well, four if you count the purple). I like the leather one the best. It’s just super clean looking and ultra-light. Plus, I can wear it in settings where the rubber band might not be as fitting. While I also have the silver metal one, I find that particular style color a bit dated. But that’s just a style thing – and they’ve got a darker shade one that’s much more appealing. So to each their own. 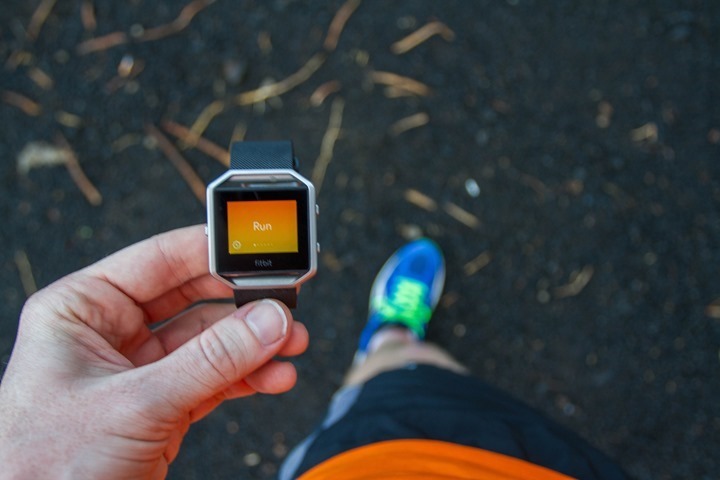 Strava Sync: Back a while ago, Fitbit introduced the ability to sync your workouts to Strava. This is similar to what Garmin has in terms of workouts getting automatically sent to Strava upon completion and syncing with your phone. In general, this worked fairly well for me. I had a few cases where I’m not exactly sure why a workout didn’t show up on Strava. My only guess being that a conflicting workout from another device showed up there first, which sometimes can throw Strava for a loop. 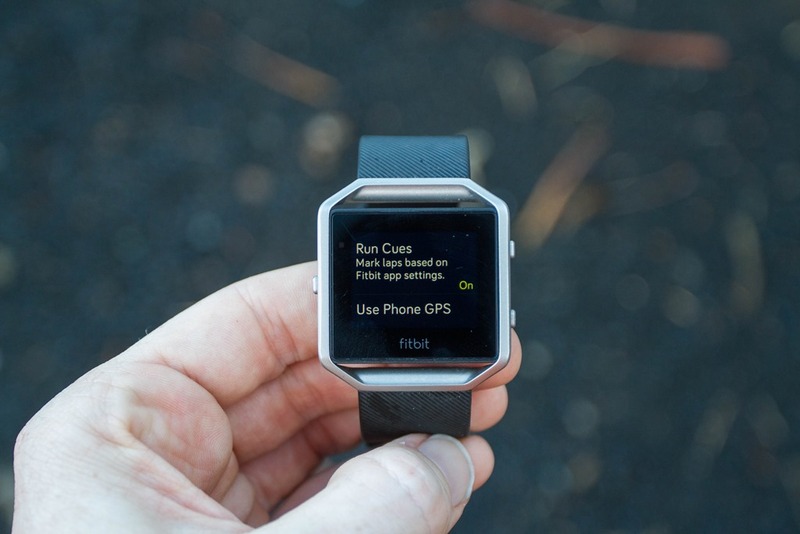 Exporting: Note that the Fitbit Blaze does allow you to export workouts directly from the site using a .TCX export function, which is one of the major standard formats of exporting workout files with GPS and HR data (though, not with workouts lacking GPS data). For those workouts with GPS data, it works without issue. For those without GPS data, you’re SOL. A minor bug: I did run into a bug during the first week of testing, that resulted in the unit crashing rather frequently (upwards of numerous times per hour). 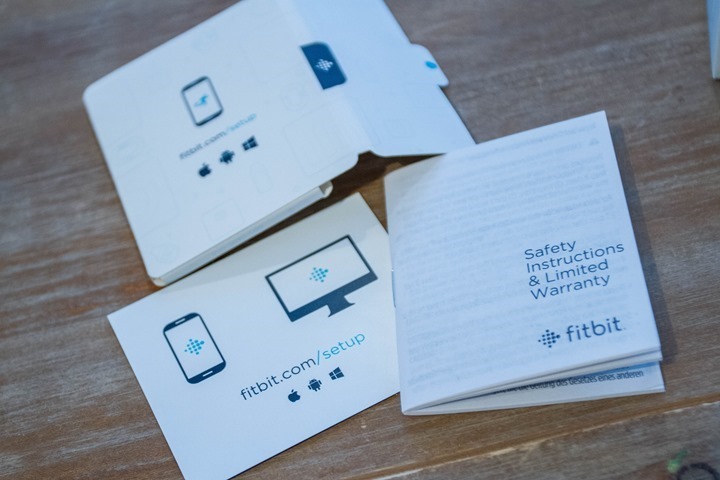 However, the Fitbit crew was able to get some logging data and found the cause of the crash and issued a new firmware update. Since then the unit has been happily crash free. I’ve added the Fitbit Blaze into the product comparison database (under the Activity Trackers category), to allow you to compare it to numerous other options on the market. 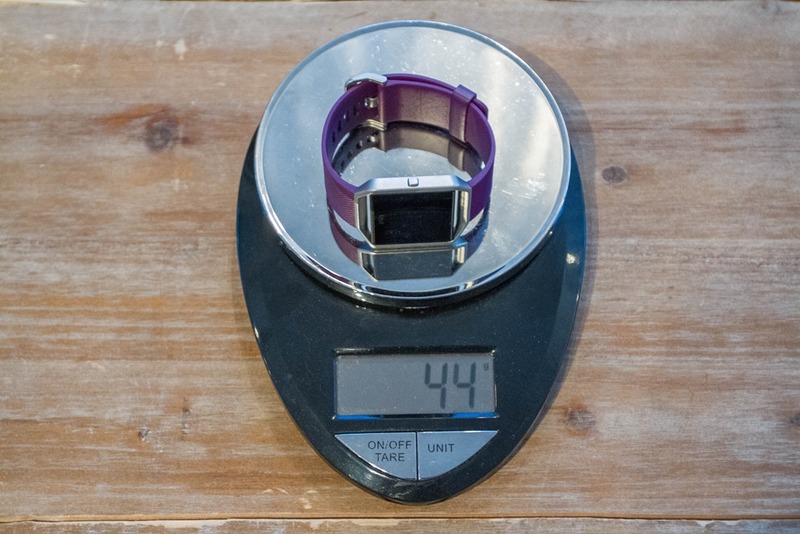 For comparison purposes below, I’ve compared it against the Fitbit Surge, Garmin Vivosmart HR and Fitbit Charge HR. But using the comparison tool you can make all your own graphs. Again, remember you can make your own comparison charts here using the comparison tool. 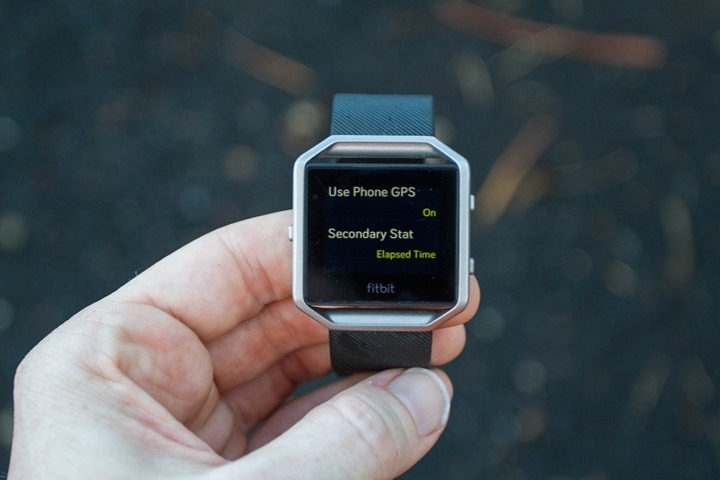 Note that in general, units that have GPS functionality built into the watch are under the ‘Watches’ category, versus the ‘Activity Tracker’ category that the Blaze falls into. 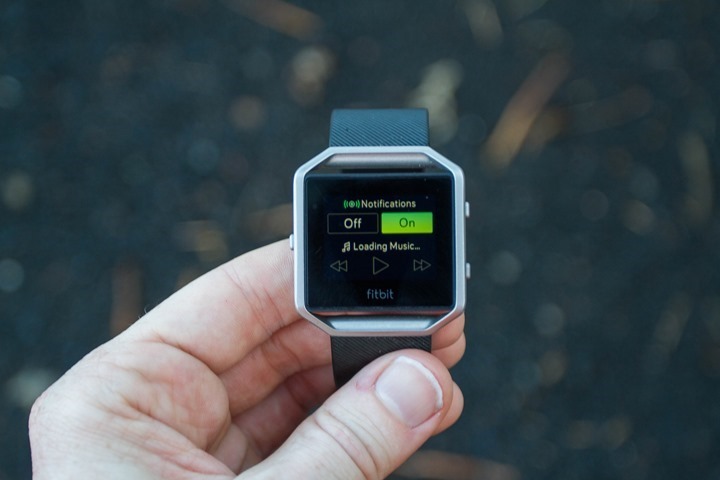 The Fitbit Blaze has the potential to be an awesome little watch – but the target audience is a bit mixed right now. At $200 it’s at or above the price of numerous GPS watches (Garmin, Polar, TomTom units), and, it’s only $50 below what the Apple Watch was over the holidays and is expected to be at again shortly. That makes it a tough sell for a unit that’s somewhat limited in functions compared to the competition at that price point. If it were at $149 with regular smartphone notifications, it’d be a slam-dunk (a point echoed by virtually every analyst and reviewer in the market). Of course, as Fitbit knows – much of the activity tracker market now is catering more and more towards making stylish activity trackers (even at the expense of accuracy). And the Blaze has many options for making it more stylish through accessories. And if you don’t plan to use it for tracking HR data in workouts, it overall works quite well the vast majority of the time. And for a large portion of the population – they’re just looking for a stylish activity tracker. And this delivers on that. Further, while it struggles on HR during workouts – it does get the rest of the day right. 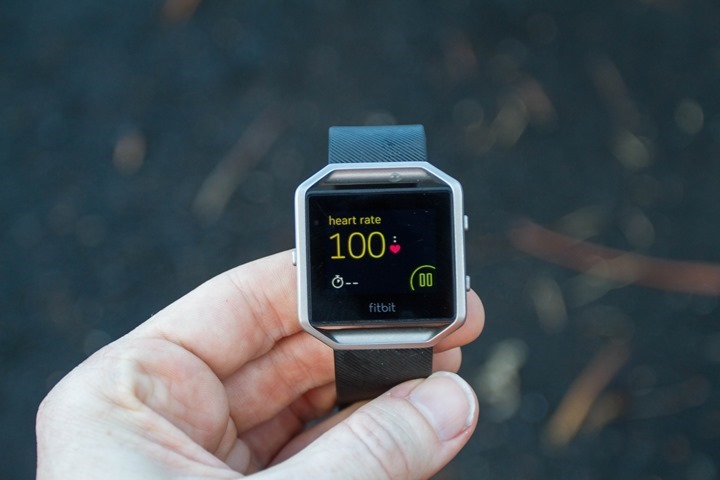 And with the upcoming tweaks to resting HR algorithms, it may make for one of the most appealing all around activity trackers out there, especially once accounting for the vast Fitbit platform and fitness site partnerships. 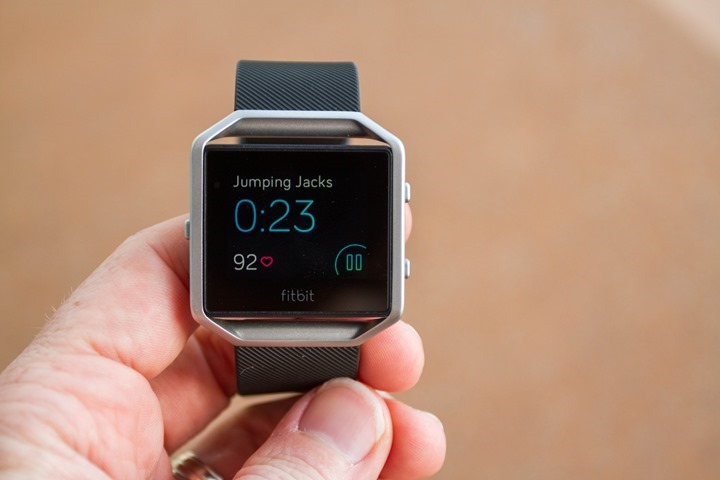 And with 21 million units shipped last year, Fitbit has demonstrated time and again they know how to do that piece well. 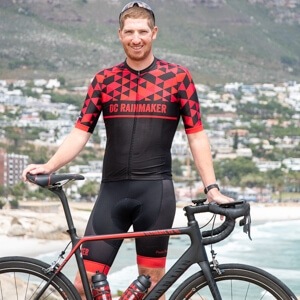 I’ve partnered with Clever Training to offer all DC Rainmaker readers an exclusive 10% discount across the board on all products (except clearance items). 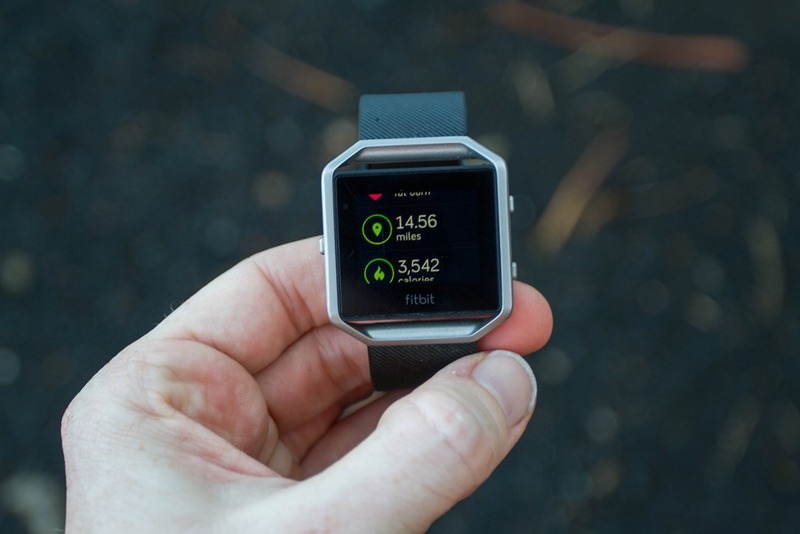 You can pickup the Fitbit Blaze (or any other Fitbit Blaze bands) from Clever Training. Then receive 10% off of everything in your cart by adding code DCR10BTF at checkout. By doing so, you not only support the site (and all the work I do here) – but you also get a sweet discount. And, since this item is more than $75, you get free US shipping as well. It’s an Apple Watch with the corners cut off, literally and figuratively. At least it’s kind of pretty. I do think with the right bands (like the leather one), it’s prettier than the Apple Watch. Obviously, style is pretty personal. 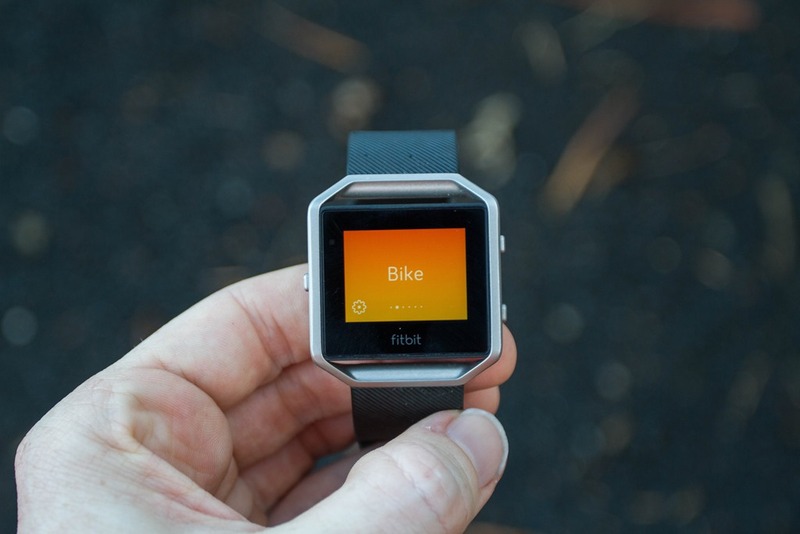 Thanks for a nice little write up on the Fitbit Blaze. So, i have the charge hr on my wrist as of now, and i’m looking to update it. As i find it inacurate and pretty ugly in fact. So the Blaze and Garmin Vivoactive hr was on my shortlist. One of the more important things for me, is the ability to display my hr ALL the time during workout. Like on a spinning session, when i find the double tapping to be pretty annoying. So the above mentioned devices, who can display the hr all the time? I don’t know if I’m the target audience but as someone who regularly works out in the gym and thus doesn’t need gps, this should have been the ideal device for me but I want HR accuracy. When it latched onto your running cadence, do you think it just had no HR reading at all or was the cadence just stronger? I’m wondering if it would be any better doing something other than running and without the vibration issue from cycling. For example, did you record any data during the Fitstar workouts or anything? Either way, great review as always! You’re the only reviewer I’ve seen who actually posts useful information and data about accuracy. A little bit off topic but do you have any sense of how to measure the calorie count accuracy? I imagine it’s basically just a formula based on your heart rate or something but I really have no clue how it works. I think the cadence was just stronger. So for example, typically it might happen with devices when running downhill (I saw this with the FR235 once). My guess is it would do better on an indoor trainer, since there’s no vibrations to worry about. I didn’t test it there. That makes sense. Thanks! I think I’ll probably just go for it and hope for the best as it is exactly what I’m looking for if I can get even decent heart rate data while at the gym. I wonder if wearing optical hrm devices under a towelling wrist band would improve their performance? Of course that might not be so useful in real life, but it might help understand the cause(s) of the issues. From my experience yes, that sort of thing does tend to improve things a little. When I am wearing sun sleaves while out riding my bike, I get more accurate (still not perfect) readings from my Fitbit as compared to my chest strap (I actually use the chest strap to record work-outs, and a Fitbit for general activity tracking, but tend to wear the Fitbit even when working out just for interests sake). Whether this is due to the sleave reducing the vibration of the watch in relation to my wrist, or from reduction in light pollution, or a combination of both I’m not sure. Did you ever end up getting this and how did it work out for you? 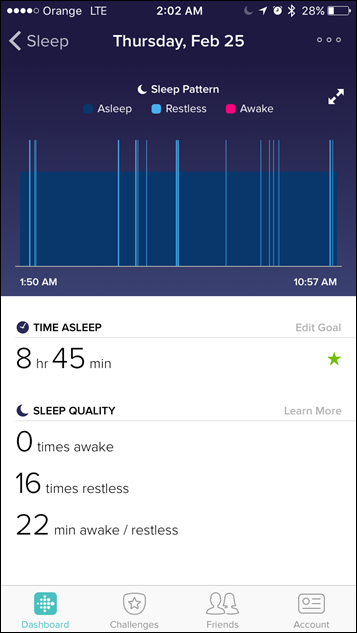 im in the exact same position as you.. i currently have Microsoft band 2 and im not quite happy with it.. Thanks again for getting out such a detailed review in such a fast turnaround time Ray. 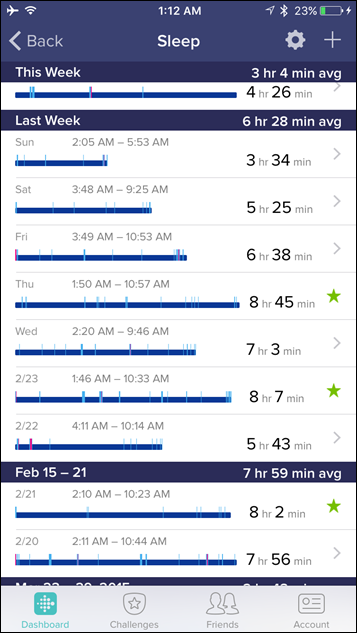 From the sleep logs above, with the amount of training you do there seems to be a bit of lack of sleep. I myself am useless without a regular 8hrs per night. 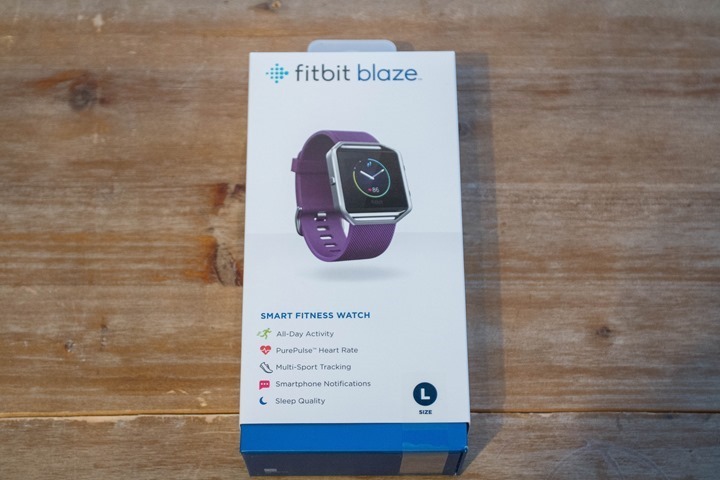 As for the Blaze I sincerely hope the class action against Fitbit succeeds. It is in my view criminal for such a large well known international company to release a product at that price that is completely inaccurate from a hr exercise point of view. Odd, yes. I had added that line-item into the activity tracker tables last weekend, looks like it got set to no then. Updated. 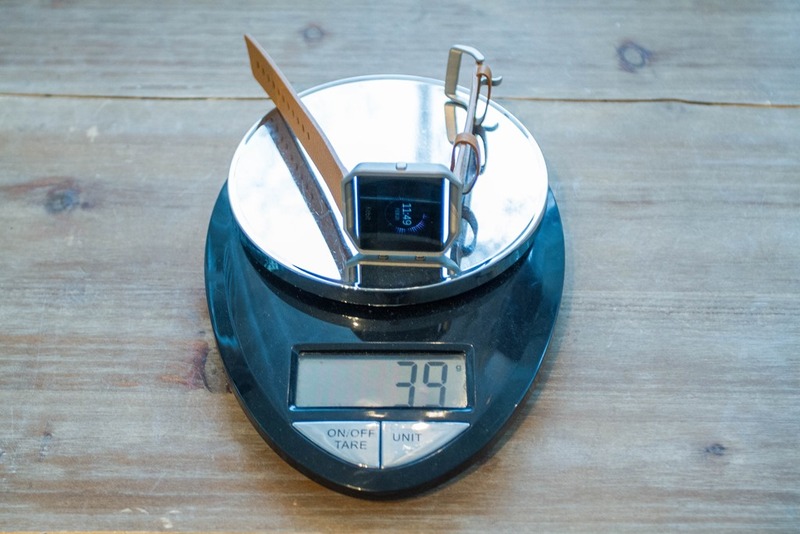 Oops, you’ve used the same photo for weight of leather and metal bands. Any photos of the Blaze on a girl’s wrist? No, but I’ll take some today and add them in. So you know Bob from accounting too? He sure does get around. I did not know overage was a word, thank you. Doesn’t really seem that anyone other than garmin is getting the optical hr for workouts plus 24/7 even close. Is that fair? Am happy with my suunto plus scosche at the moment, but if I had to upgrade it would be hard to argue with forerunner 230/235, vivoactive hr or fenix 3 hr. Is it that bad that your not going to go out and buy you’re own? I still will, and hopefully they’ll address at least the notifications piece. They’ve (CEO) hinted at that in some recent interviews. Kinda weird they just don’t say it- especially when so many reviews are coming out and noting it. Easiest possible thing to preempt and just note an update is coming on XYZ date. How strongly has the CEO hinted at the notifications? I’m trying to decide between the Samsung Gear S2 and Fitbit Blaze and I feel like the notifications are the dealbreaker. bitTicker is a third party Android app that will push more notifications. Sad that it takes a third party to set it up, but fills the need for Android users. I don’t understand why the device isn’t waterproofed. It’s probably silly, but, for me, it makes a device impractical and not worth buying, especially for $200. those are the worst when you can’t tweak! especially something so small. Are there any plans to add the Move notifications to the Blaze as well as having them on the Alta? “coming soon” according to Fitbit moderators on the Blaze forum. If the move notifications are implemented like the Alta, all you would have to set alarms for 10 min before the hour and if you did not take 250 steps in the last 50 min. then walk. The same as the Nike Band that was at 45 min on the hour, however that alerted if you moved or not as I recall. So far, I think Jawbone is the only one that has activity alerts based on the previous contiguous time period that varies to your choice. This is much closer to what I’ve always wanted [from Garmin]. I wish some of the watches could be taken apart and a pendant be made out of the important bits. I always want step information per day. I don’t always want to wear a watch. 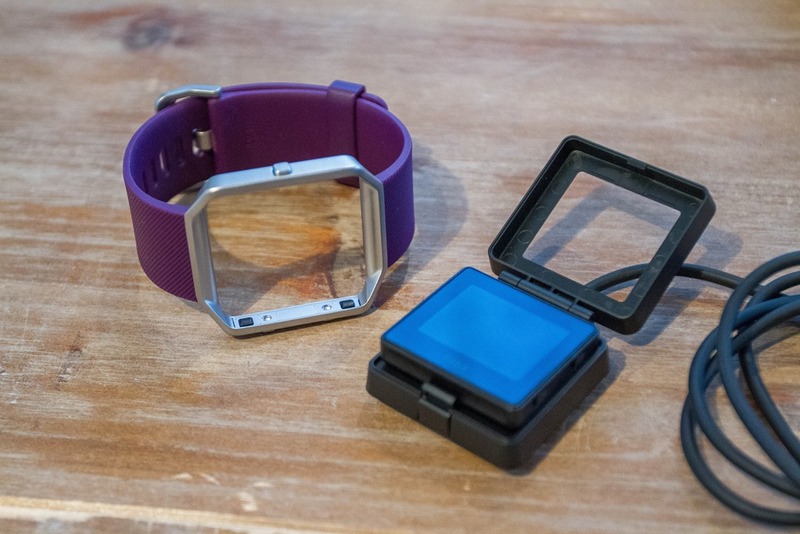 Often I want to wear both a tracking device and a non-tracking watch. The Forerunner 15 comes close I guess – it can be removed from the band and then probably connected to a chain. This Fitbit is even closer. The body is already complete, separate from the band. Now it just needs a chain to be worn around the neck. Or a clip to be worn on the belt. It’s more money but Fitbit has the full range of products now… watch, bands (thick/thin/stylish etc. ), and clip on trackers. The best part is unlikely EVERY OTHER company in this space they work seamlessly together. If you interchange them during the day you have to do nothing and everything gets not only aggregated in the app/website but the data gets pushed to the other devices too! Thank you for the review. I was eagerly waiting for it, ever since seeing the Blaze in one of your pics. Under “Smartphone Notifications” you have an unfinished sentence or fragment: “Since there is no ‘lock’ function on the device, ” and then nothing. The whole Fitbit universe is a fashion, not function oriented one. In that light, I can see how they want to charge $199. That is a fickle market and I would not want to own any Fitbit stock, however they are kinda prevalent right now. Since my entire family is on fitbit’s, I may just take the Blaze as the most masculine Fitbit as some sort of daily tracker. That said, until the notifications are fixed, this is a no-go. 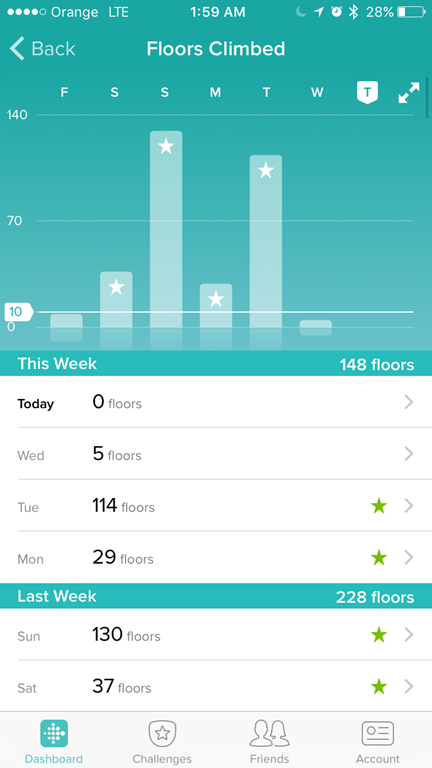 Nedim – Since returning Fitbit Force under recall, I switched to using my iPhone 5s as Fitbit step tracker. How is the inactivity tracker notifications? 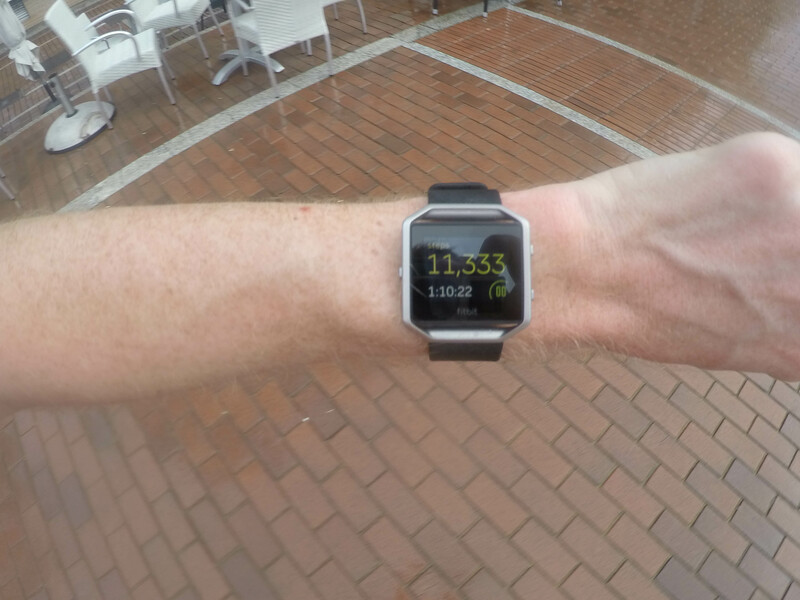 I tried the Garmin vivosmart hr and didn’t really like the distance needed to reset. I sit a lot during my day job and want a smart watch that will tell me to walk around a bit ever hour, not so much walk a certain distance to reset. Do you have a recommendation that will fit that bill? Inactivity notifications coming to Alta first. 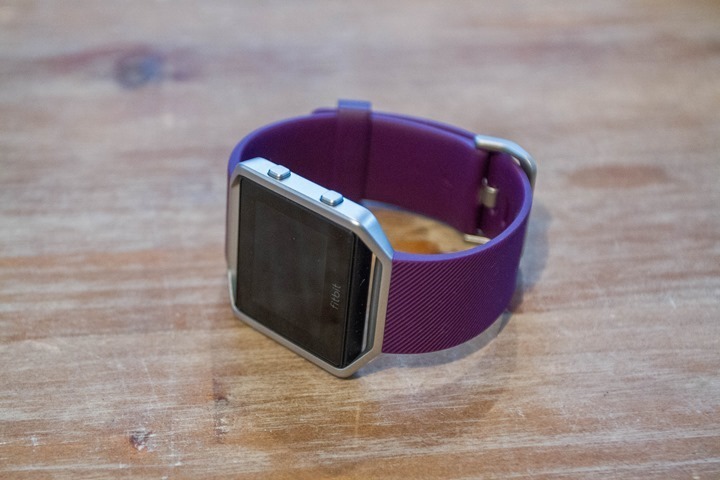 Not available yet on Blaze – Fitbit moderators on forums say “coming soon” with no date. 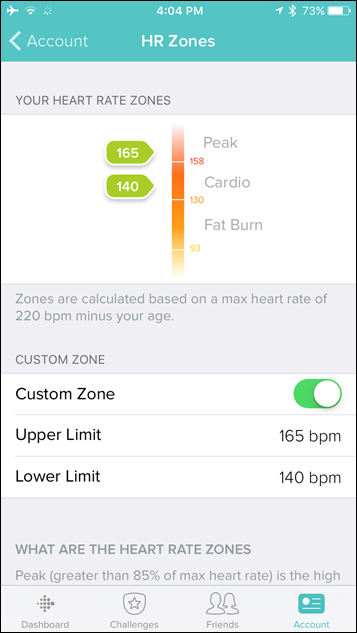 Do you know if the changes to resting heart rate algorithms will make it to the surge? Much like your example Im looking at surge with heart rate showing 49 but resting rate showing 55 on app. My understanding is that it’s a backend change – so it’s good across the board. Do you know if this change will impact historical data ? My resting HR on Charge HR has been going down consistently past few days lower than ever before. 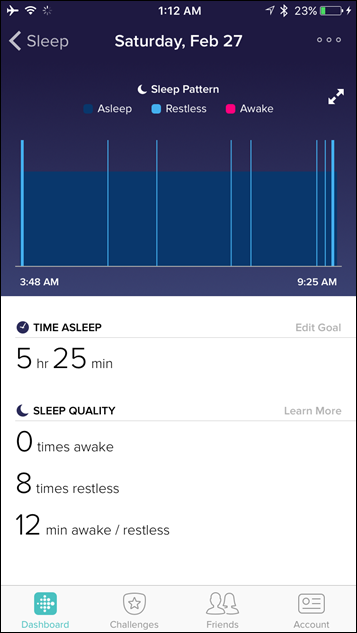 Looks like it could now actually be lowest recorded while awake, but I still get a few BPM lower while asleep. Also guessing something has in the algorithm changed in the last few days with my average heart rate dropping 1bpm per day (strange as I’m full of a cold and would normally expect it to creep up). Yup – folks should be seeing changes (slowly). I’m not yet, fwiw. They’re looking into why it’s not ‘working’ on me. At that time, Fitbit engineer stated there were no plans to support exporting of non-GPS activities. I had considered this as I liked its looks and the fitbit app/community idea, but disliked needing my phone for GPS and disliked the HR inaccuracies in other fitbit devices. So this is definitely no the device for me but this review affirms my feelings about it. 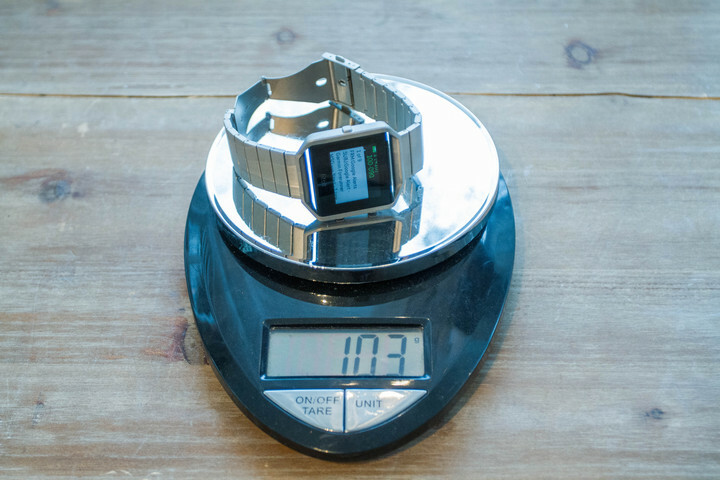 I am preordered for the Vivoactive HR and at this point I don’t think I’ll be cancelling that! They promise every bit as a good a workout as the 8 minute folk. Hmm, odd. 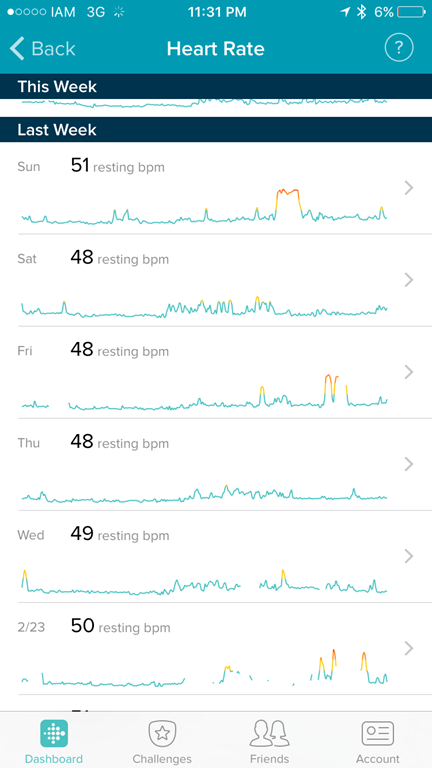 I’d ring up Fitbit support, as you can see the screenshots in my review show it does seem to work for at least me. Thanks for the review! I’ve been waiting to read yours, since they’re always so thorough. Mine should be arriving in the mail any minute now…. 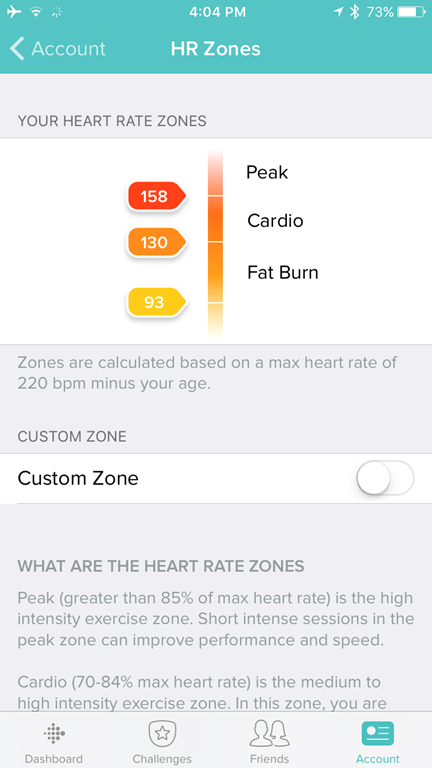 You compare it in the table to the Vivosmart HR; can you also add the Vivoactive to the chart? 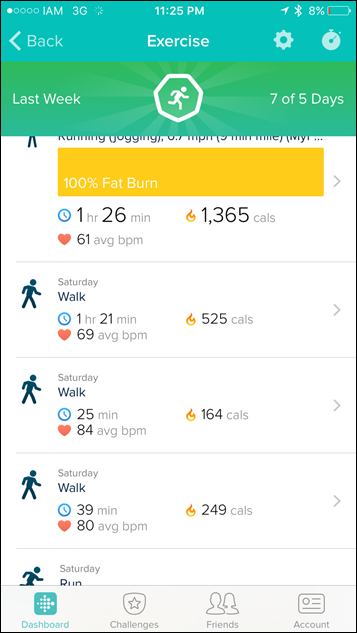 I know once the new Vivoactive becomes available, with the HR monitoring, there will be a lot better direct comparisons to be made, but I’d like to see the stats now as they are. I went to your “comparison tool,” but didn’t find the Vivoactive on your list. Thanks! I’ve got the Vivoactive (HR and original) in the comparison charts, but it’s under the ‘watches’ category, mostly because it has GPS. I originally created the activity tracker category for simplified activity trackers – though over time they’ve gotten more and more complex. One day Ray is going to post the wrong data set and reveal that he’s been James Bond all along. Great review – have been holding out for yours before making the final decision to buy one or not! 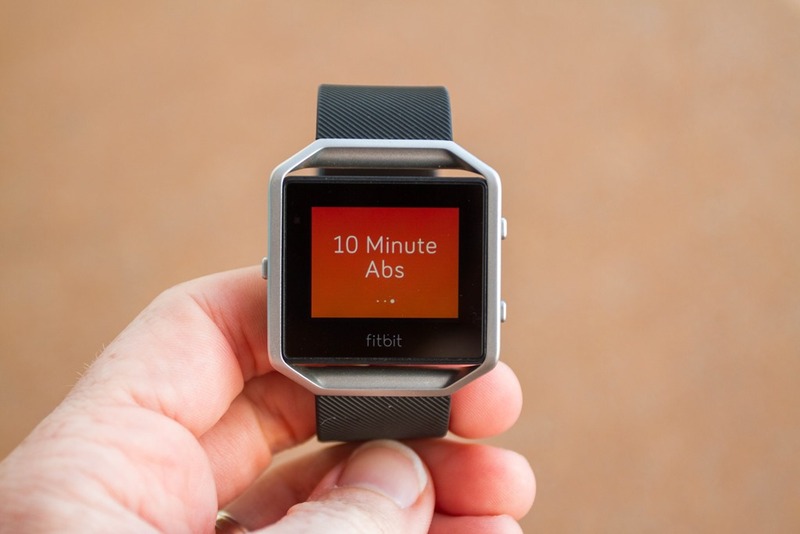 One question: How effective/accurate is the Fitbit Blaze for tracking general gym sessions (eg circuit training)? I find I get phantom steps from whisking. But that’s pretty good exercise anyway! So does the module snap in pretty securely? I’d be a little worried that sucker might pop out. No problems there, it’s pretty secure. Plus, it only snaps in via the backside, so there’s no real risk of it ever falling out (that I can see anyway), unless your hand is chopped off. But I figure at that juncture you’ve got other issues to worry about. 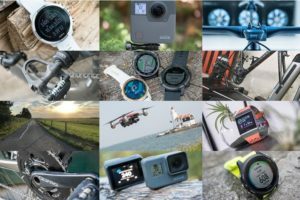 In the beginning of the article there is a picture comparing the watch with other watch faces. Does anyone know what watch is the round one? The name/maker of the round one? You probably mean the non-Garmin one (FR230), that’s Motorola 360 Sport Ray is still testing. As a Charge HR owner I can confirm all you said about it. A good everyday tracker, not good for exercises. 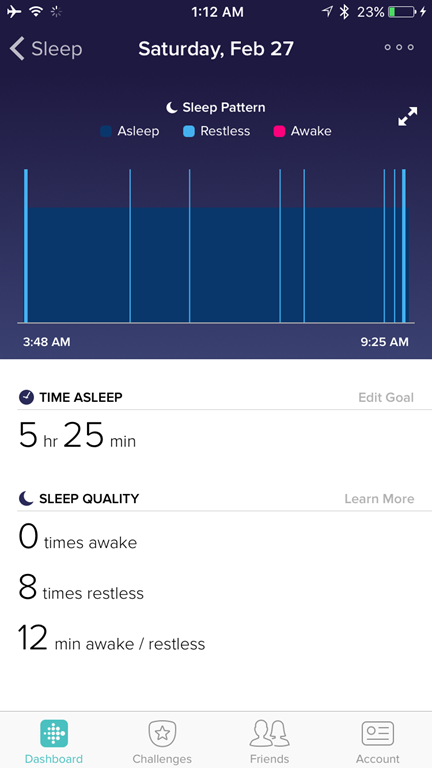 The sleep tracker is good. 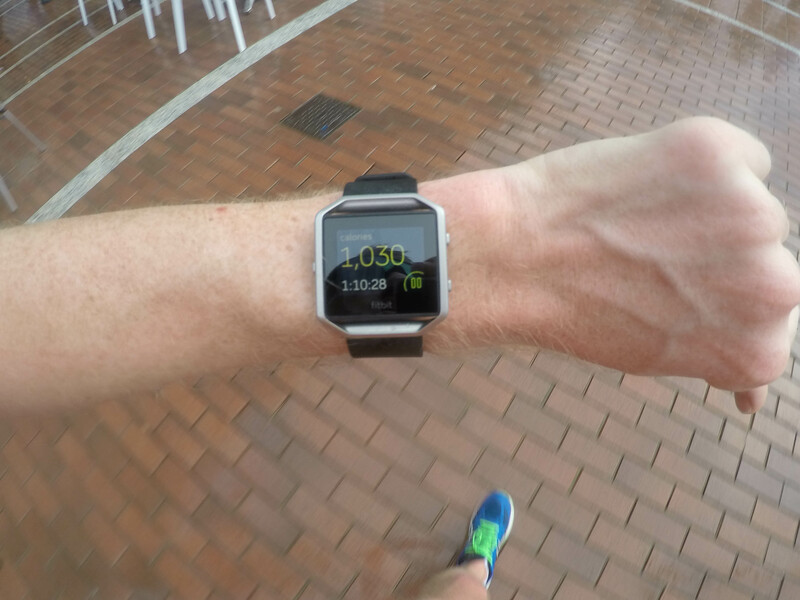 Your comparison table suggests Fitbit Charge HR is waterproof to 1atm – is this correct? Previous info I’ve had is this also is only splash proof?? Ah thanks for the link, that explains why mine hasn’t died those times I’ve accidentally worn it in the shower. I’m a bit concerned though now, I had thought to switch to the Blaze, love the look, but on paper the Charge HR is as good, looks notwithstanding. Something to consider. Thank you for your review! Comparing this to the Vivoactive which one would you choose? I wanted to ask the same question! Any thoughts? It depends on your goal. I think the Surge is a prettier watch, and if you have most of your friends on the Fitbit platform – then it might make sense to stay there. 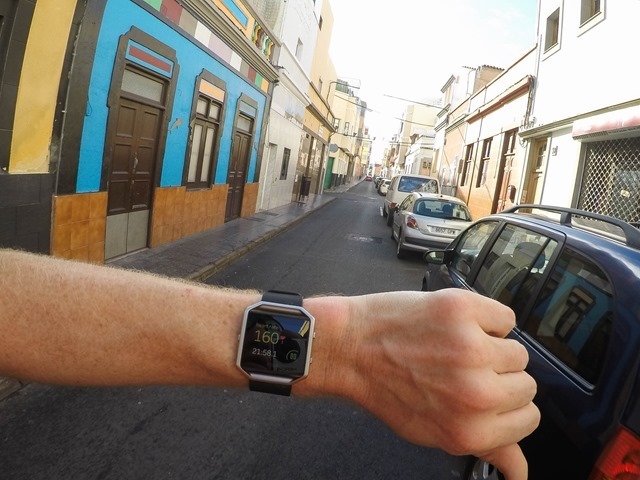 On the flip side, the Vivoactive (original or HR) is a far more capable GPS watch. So in many ways it’s better than Blaze. But, it’s also different. You think i could use the blaze while playing soccer in order to track my movements and covered distance? Of course I’d protect it with something. 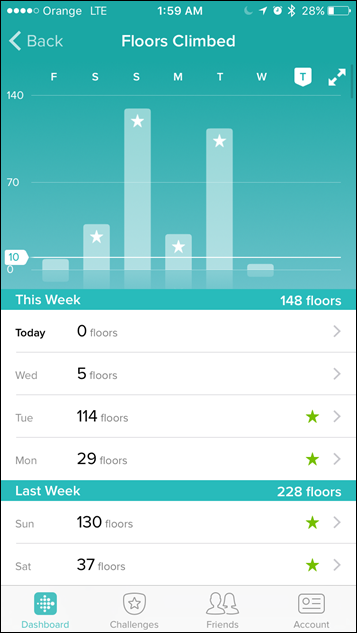 Great to hear Fitbit are looking into ‘fixing’ their resting HR data. Seems to be an issue for lots of folks out there. But even if this is fixed, how do you track long term trends? Both the mobile app and the brower based dashboard only seem to show 30 day history. I’m not aware of any way of pull the data to view in another app. Anyone know a way of getting the longer view than just 30 days? If you expand the graph using the arrows in the top right it lets you scroll back month by month with the full graph as well as your average for the month. I find it a useful view for seeing the trend. For running mode(ie selecting Run not auto-detect) you said Bluetooth phone and Fitbit App running in the background. Does that mean if I did a bunch of things on my iPhone(launched other apps and used lots of iPhone’s memory) and maybe the Fitbit app is not really “running the background” anymore, that I cannot do an actual GPS run with all the stats I would get for a true workout run? Yes, you can do other stuff and it’s fine. 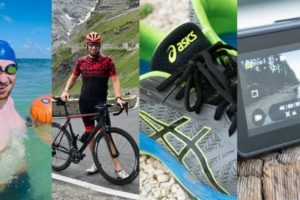 After a run or ride with the connected GPS and an upload to Strava, will you still have timed strava segments or will these not be included on the strava activity? You’ll get Segments on Strava like any other uploaded activity. Or were you referring to something else? I love how polite you are Ray. But this thing seems pretty darned terrible. Is that the power of marketing over actual product quality? Seems to be the case with their numbers so far. Or that they’re squarely aiming at the largest market who really doesn’t care about accuracy and just wants to feel / look like they’re doing something “good” for themselves. Seems like a product mgmt fail to me. But maybe it will actually be a commercial success. However, for some that don’t care about HR, but just want a prettier step tracker, it’s a nice little device (minus my irritation with the notifications). 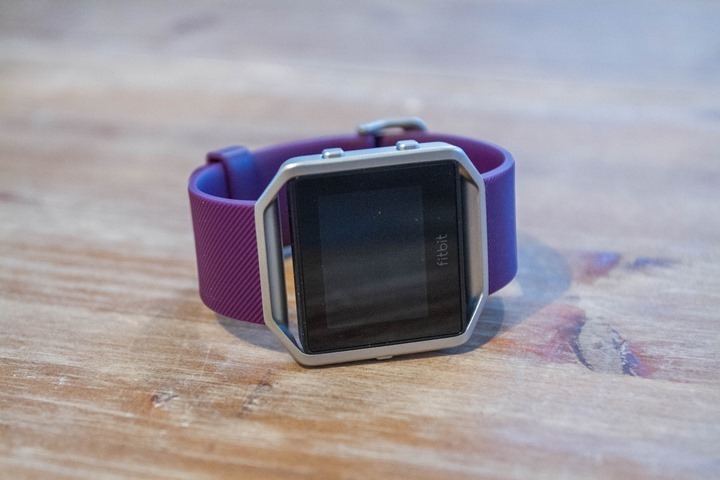 So, this is basically the Fitbit Charge HR with a bigger screen, and better HR tracking algorithm? I ended getting one of these. It has whatsapp notifications but seems to make me choose one set of notifications between hangouts, whatsapp, and messages. I don’t know if this is an android quirk but it is vaguely annoying as whatsapp and hangouts would be all i need if I could get both at the same time. Love the device otherwise. there is app called bitTicker Notifications in Google Play store for $2. 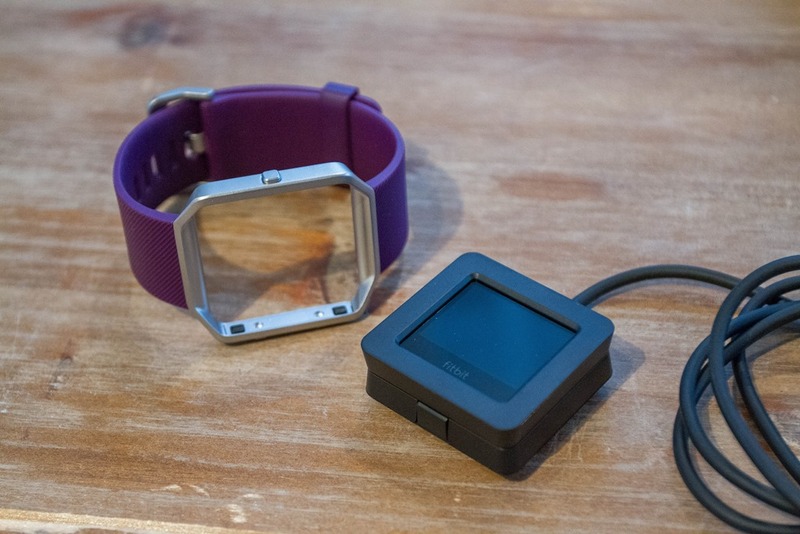 It turns your fitbit into fully functional smartwatch. I got it for my blaze. Now i receive text,whatsup,hangouts,bbm,email etc. works well but it does affect blaze battery. i guess that is why Fitbit does not offer all notifications because features like that affect battery life. Is it possible to set HR alarms just in the 24×7 HR mode? My son has a heart issue and I’m thinking of getting him one for that purpose. No. I suspect they don’t allow it for pretty much the exact reason you’re asking (since they’re currently getting sued in a class-action lawsuit for it being used as a medical device). Thanks Ray. Could he set it to Run for example during an activity and use hr alerts that way? After further reading… am I better off waiting for the vivoactive hr? Both due to the better optical sensor and because I could theoretically write my own ConnectIQ app to cause an alarm in 24×7 mode? After seeing your post, I have to say, without knowing the seriousness of your son’s heart issue, that you should not really be “relying” on these devices. However, if it’s not that serious, for 24/7 hr and nothing involving strenuous activities like crossfit, sports, interval like training,etc, then the accuracy is certainly good enough. I definitely won’t be strictly relying on a hr monitor for my son. It’s just another tool along with his perceived exertion to help. Thank you so much for the review! 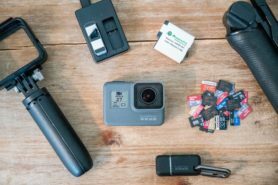 I’ve been looking for a review that actually provides data and compares them with other brands and models. Yours is the most helpful and insightful I’ve read. I hope you continue to write more. 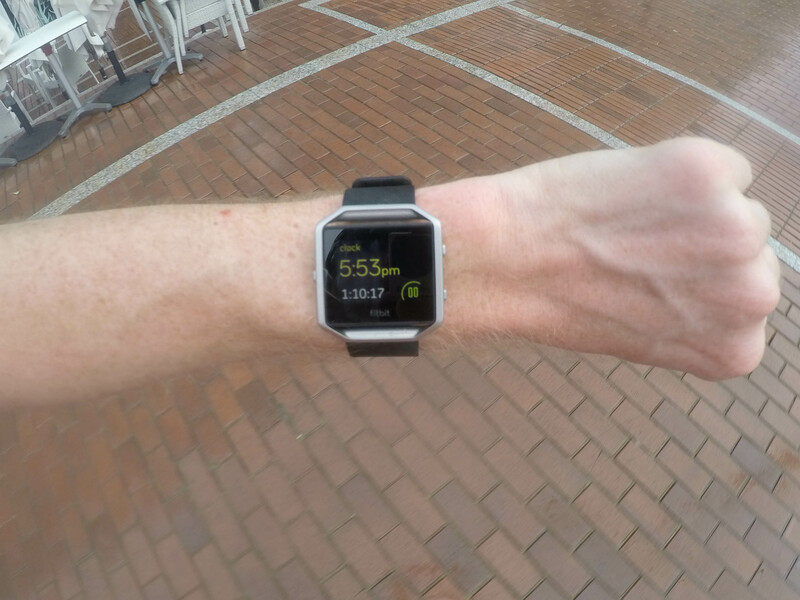 I am hoping you review Garmin’s Vivoactive HR. I’ve been choosing between Fitbit’s Blaze and Garmin’s Vivoactive HR. If you do make a review of it as detailed as this review, it would be of great help. God bless! Cheers! 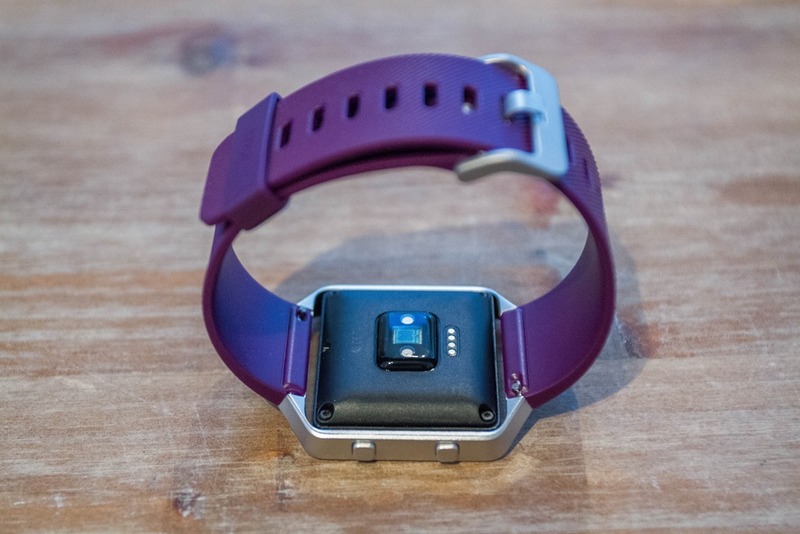 There will be an in-depth review of the Vivoactive HR, once it starts shipping. 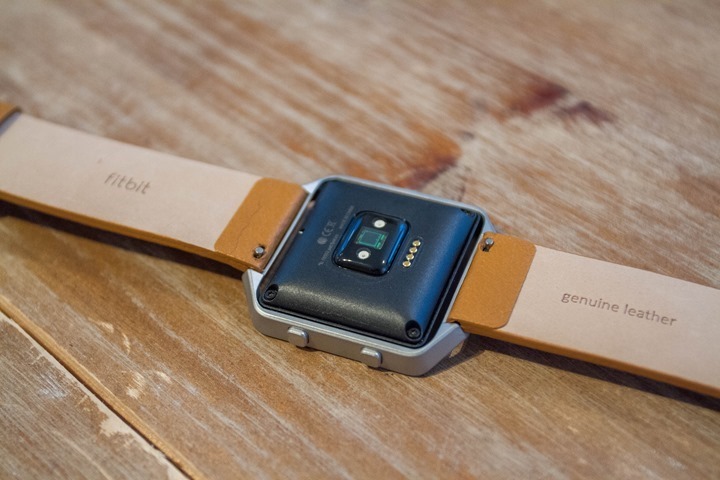 I think good alternative to potoval wrist monitor will ne this product. How would you compare this to the Basis Peak? I read your review on the Peak, but have you used one since they came out with the update allowing notifications? Quick question. What is the correct measurement for RHR. Is it the LOWEST INSTANCE heart beat in a set period of time? Or is it an AVERAGE heart rate during a resting period of time? I’d say it’s the lowest (valid) HR posted. Whether or not that includes sleep is debateable however. I WISH I read this article before purchasing the blaze. I had the exact same frustrations as you do. I work out at Orangetheory quite frequently where we use polar heart rate monitors (with chest straps). I compared my fitbit blaze workout summary with that from orangetheory and the calorie burn was a DRASTIC difference and there were many times when my heart rate was in higher zones on the OTF monitor that did not register on the fitbit blaze. I’m super disappointed. For those trying to track intense fitness, this device is not for you. 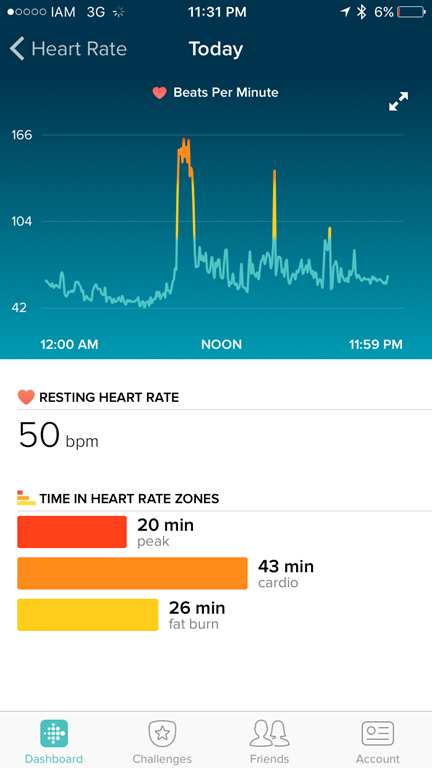 I do crossfit and noticed a huge discrepancy between the readings on my polar ft7 and the Fitbit blaze. It is definitely not meant for intense workouts, wish I had known this before hand. I was hoping to use a device that did not require a strap. So how do you like the Blaze now that it’s been about a month later? Would you recommend it for someone new to fitness trackers or would you recommend something else? If you want advice on how to get fit based on your diet, exercise and sleep there is only one option. And that one option is only available on Android or iPhone. Right now they are only $99 at BB. 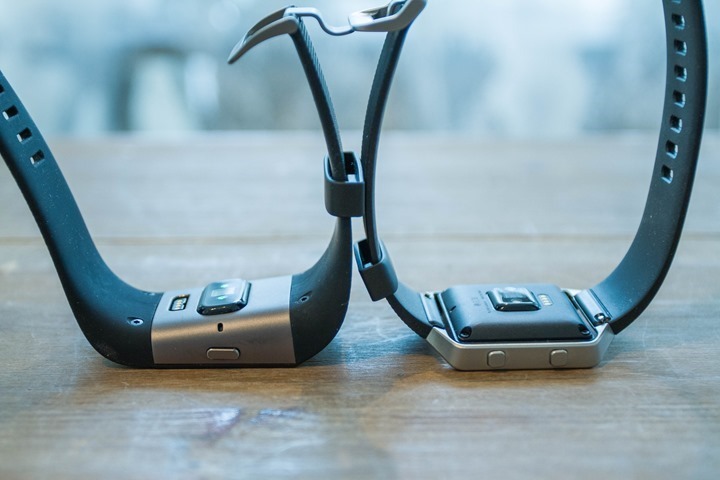 Jawbone UP3. All these devices that show you what you have done do not compare to devices that tell you what to do. I am no way associated with Jawbone. Just a quick question. 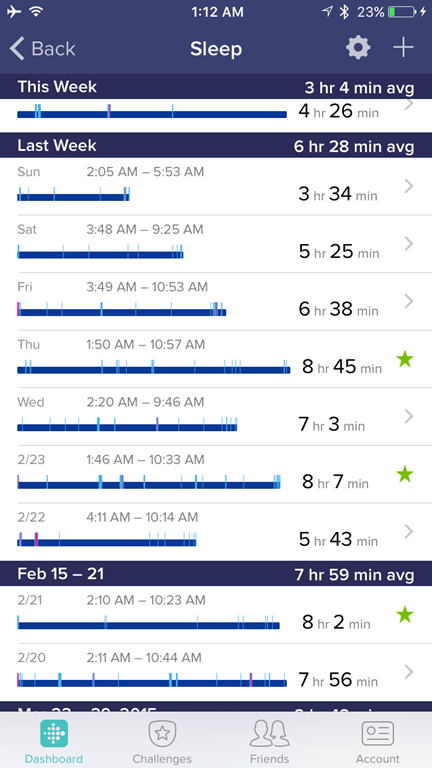 My FB Charge HR reported resting HR Never goes below 48, no matter what I do. I see this in your screenshots too. Have you ever seen it go lower? I bought this and had it for a week. My charge hr died on me after just 6 weeks of use and I decided to upgrade to the blaze. Love your reviews! I was thinking of getting this but pre-ordered the Garmin Vivoactive HR. Do you think that was a good pick based on your experience with the test unit? While I don’t have a final Vivoactive HR yet, thus far, I’d say the Vivoactive HR is a better fitness unit than the Blaze. Though, the Blaze is more fashion-focused. Thanks for the prompt response. I read your review on the beta VAHR and it seemed pretty positive, so I figured the final may be more crisp. I want something that that I don’t have to worry about getting dirty. I do a lot of trail running, mountain biking and high intensity workouts, so I thought this would be great for running and intense movements. While the FitBit Blaze is attractive, we are finding it does not accurately count steps. Substantially underreports step count. 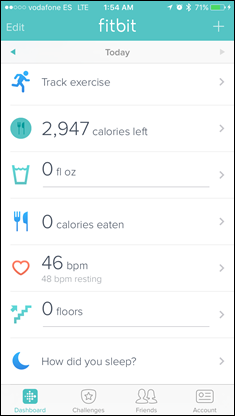 When we contacted FitBit, their tech support validated this through verbal step-count on the phone. They sent us a replacement, which had the exact same problem. Unless we are exceptionally unlucky, there seems to be a problem with this model that we have not experienced with the Surge (which we also own and are happy with). Disappointed that FitBit would not provide a refund and only continues to offer defective replacements even though their tech support agrees that the product is not working properly. Oh wow, I’m sorry to hear the Blaze is giving you problems. I appreciate you posting the comment thought, my wofe was thinking about upgrading from the Charge HR to the blaze. I’m going to share this with her. Yes, no problem going a few days without syncing. 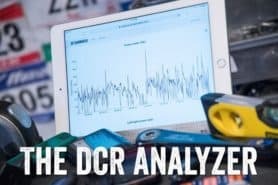 As a triathlete, need a GPS that can tell distance on land AND water. I can put my IPhone 6S in a waterproof case-how about the Blase or any other competitors watch? When swimming in open water-ocean or lake-how far did I swim is of importance. Ray, any update on when move notifications will be introduced to the Blaze? It can not keep up with my heart rate when I work out which is frustrating. Super duper slow. Fitbit seems to be pretty prompt when responding to Facebook inquiries. Also, I need to figure out how to keep it on one time zone when I travel. They responded to me but I need to go back and look up what they said about this. Also, I read that you have to measure the length of your stride so measure 100m and run to get distance correct. People were having problems with their runs because their strides were different than what’s automatically programmed. Funny thing, I did accidentally wash mine in the washer and the water didn’t affect it! So maybe it IS in fact water proof! ? Thanks for all the reviews. It really helped me to decide which model I want to get. The only thing I was still wondering was how securely did the fitbit fasten into the frame? And does it seem like will get loose over time with changing frames and taking it out to charge. Thanks! are the band issues taken care of for allergy / burn? I returned my charge hr….. Does the Blaze sync with Strava? Thanks for this great review. CNET used to be reliable but now it’s all about volume and less in-depth review. I bought a Microsoft Band 2 six months ago and I was full content since it has everything especially with regards to notifications. However, the bracelet just broke(almost like a disintegration). Checking around the web, it seems like a very good number of people have the same problem. I just bought the Blaze but I’m thinking about returning because of the very issue you mentioned with the notifications. Do you have any suggestions about the most comparable watch the MS Band2? I look forward to hearing from you. People at Bestbuy are useless to say the least. Ray, thank you for your reviews !!! They are comprehensive and I can relate to your testing results. I had the Surge for 2 years now and purchased the Blaze as a replacement. After several days and really trying to make the Blaze, I ended up returning it to the store. The band is not as comfortable as the Surge. 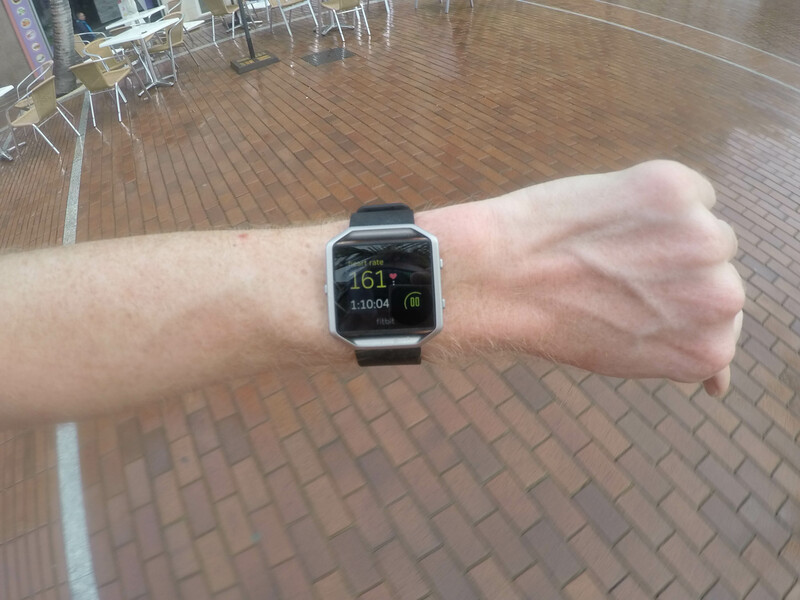 In my frustration, I purchased the Garmin Vivoactive HR which is excellent technically, but terrible to integrate with apps, software and setting up. This should be an easy task but it took a number of calls to Garmin support to sort out the issues. After few days I also returned the watch. I have purchased again the Surge, as this is the best compromise for now, and I really hope Fitbit come out with an updated version soon !!! I’m a pretty consistent runner and am looking at investing in a GPS/HR watch. I don’t like running with my phone, but I do like the features and look of the Blaze. Is there another GPS watch similar to the Blaze that does track without your phone? Or would the Blaze be sufficient if I don’t do a lot of intervals? I haven’t had a fitness watch before, so any direction would be much appreciated. 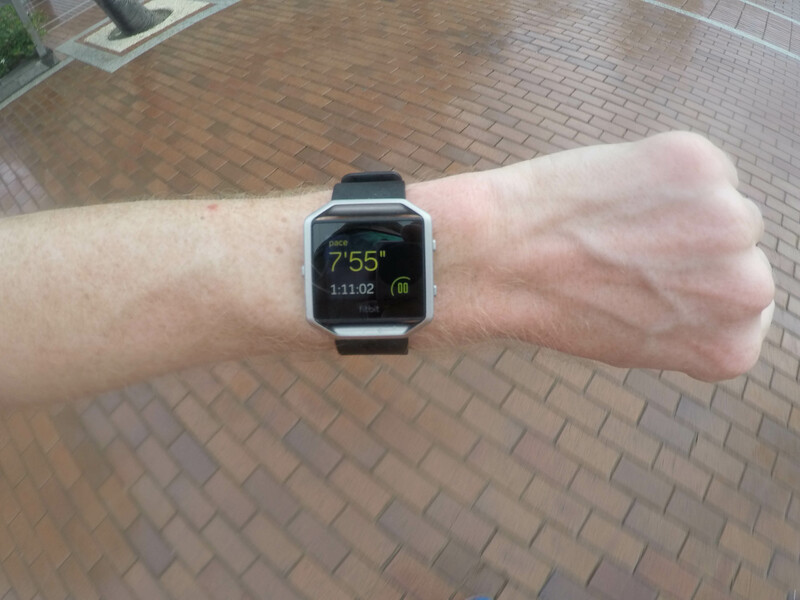 Also, does the watch display if you are in your target HR zone while running without your phone? Thanks for the great review. You are my go to when it comes to purchasing an activity tracker/gps watch. 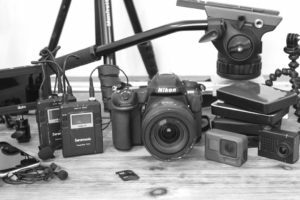 I have benefited a lot from your reviews over the years, including how to use a particular device. I just have one question about the Blaze. Can it connect with my Scosche heart rate monitor like the Apple Watch? If it can, how do I go about in doing so? Thanks! I realize as a Nurse this is NOT FDA Approved for Heart Arythemias. However, does it keep track of your Heart at rest? I am not concerned about in being off 20 to 30 points. I am having my back fused and can only Climb Stairs and Walk . So, the HR Monitor, Steps, Climblimg Steps, Calorie Counter and how much I need to walk and climb stairs to reach 225 lbs and then maintain that 225 lbs. Thank you for the thorough review of the watch. I found yours before I bought my Blaze and was inspired to write my own. I’m interested to know what you thoughts are on how it fares as a smartwatch? I came to the conclusion that choosing the Blaze over other smartwatches means that you would want (and expect) a certain type of relationship with your watch (notably: great battery life and non intrusive watch). From your use of the watch, what kind of experience did you have in this regard? 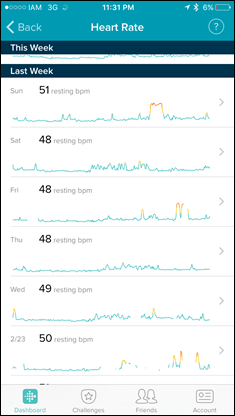 Another point I’d like to make is that there are a few annoyances that lead me to believe that Fitbit themselves hadn’t thought in touch much detail about the best way to implement these features. Chief amongst them is the Fitstar implementation. Fitstar’s standalone app became famous for its progressional nature and led exercises that were based on user input on difficulty and ability to keep up. 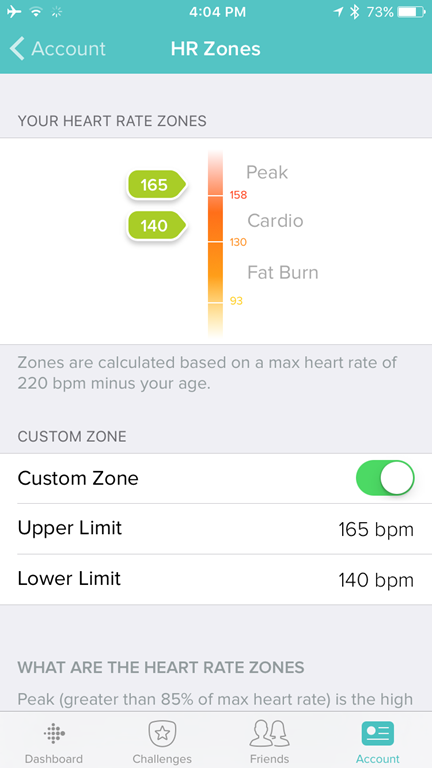 The fitstar on the Blaze is just led exercises (not very good ones at that). The Connected GPS function has failed me on a number of occasions, leaving me with useless data. One ride the data suggests I rode for 1:55:04 (correct) for a distance of 0.16km (wrong). The map shows a single, straight line between the origin of the ride and one point along the way. Another day the data shows I did 0 km in 1:21:09 with no map. I purchased the Blaze as an upgrade from the Charge HR to get GPS data for my rides and runs. I have given up using the Blaze for this because I never know which activity I’m going to get dodgy data for – it is incredibly frustrating. I had the phone in my riding jersey pocket at the back – not sure if this had an impact. Fitbit says I ran 15.4 km in the 14 km Sydney City 2 Surf but I started it on the start line and stopped it on the finish line, did not deviate from the course, and even cut corners to make the run as direct as possible. Twice I used both Strava app on iPhone 5c (all updates current) and Fitbit to record a run with Strava showing 10.1 km and Fitbit 11.0 km one one and a similar disparity on the other. These events together tell me that Fitbit is consistently overestimating my distances, which I don’t want. The overestimations of my distances also led to falsely inflated pace estimates, which is only going to hurt my training and hurt me on race day. Fitbit was a good way to get me moving, but I’m going to try a Garmin tri watch now. The watch can receive notifications from other sources. Not sure if this was always the case but it is now. You go into the app on your phone, go to my account, click on the blaze, call and text notifications, app notifications. That’s a change on the Android side, but not yet seen on the iOS side. That functionality was only enabled in the last few months (this review was written in February/March). 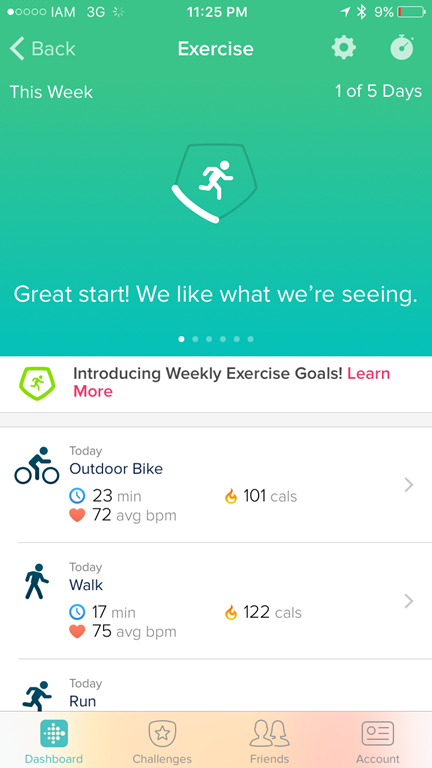 I found the fitbit blaze did not give adequate steps/credit for spinning(I put my bike on trainer for winter time). I was on the bike the other day for 1 hour of spinning and it only gave me like 680 steps. But I can take an hour walk and it gives me several thousand steps. So that is not accurate tracking in my book. absolutely lather the analog watch in main display- is there any way of setting to digital – as in work ut display? The blaze now excepts notifications from Facebook, Twitter, eBay, YouTube, Apple news and many more. There isn’t too much difference between the blaze and my Garmin edge 200 when syncing to Strava. When running I have to listen to music (it keeps me going) so it was never a deal breaker taking my phone ? I am training for the Ragnar race and am used to using the old school version of the Garmin watches usually the Forerunner 305. I just got the Fitbit Blaze to see how it compares. So far I don’t like all the gadgets with it but I am used the the Forerunner 305 which is very bare bones. Wondering your suggestion on if the Blaze is worth using for running and workouts to track since I do not like to take my phone with me always? And if so is there a Garmin watch or other brand you would suggest to track pace, HR, distance etc.